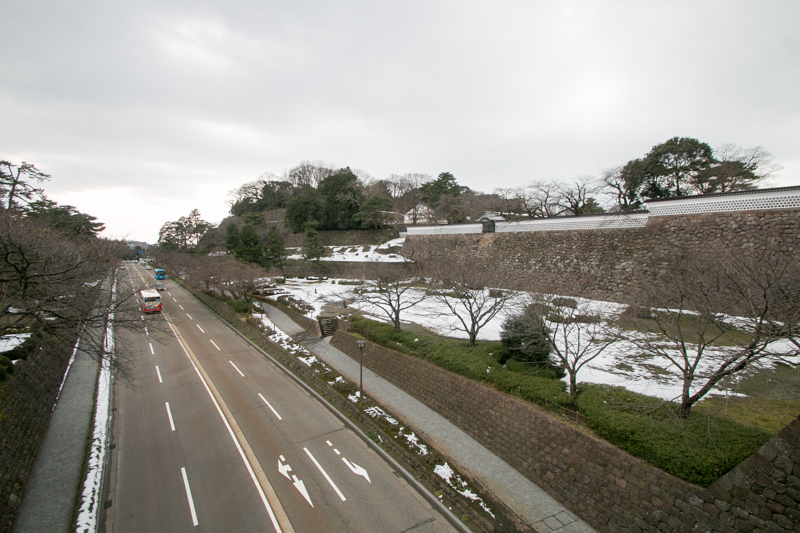 Kanazawa castle (金沢城) is located at the center of Kanazawa city, on a edge of a height spread from eastward of Kanazawa city between Saikawa river and Asanogawa river. 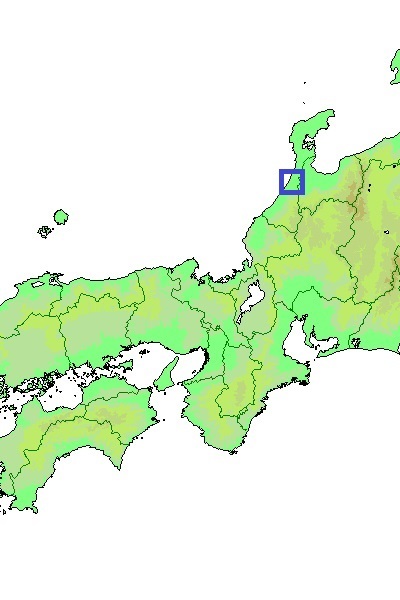 Formely current Ishikawa prefecture was divided into Noto country at northern half and Kaga country at southern half, and historically the center of Kaga country is said to exist at Komatsu city, at the south of Kaga country. 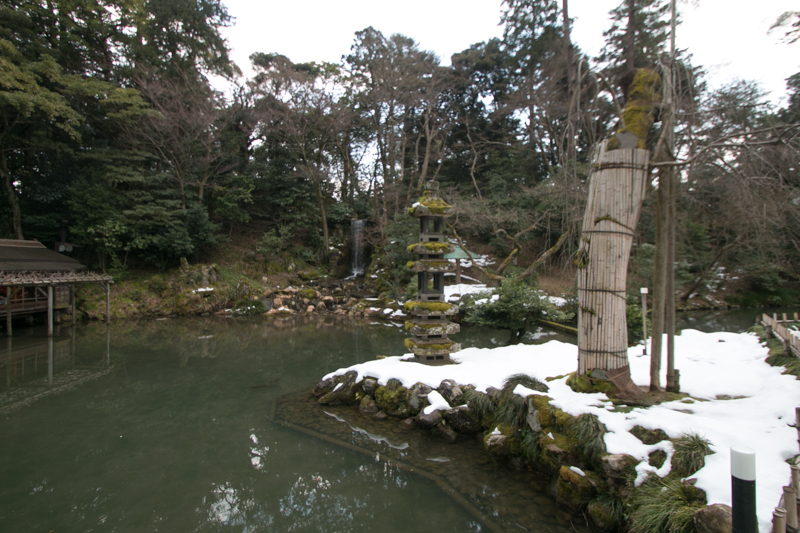 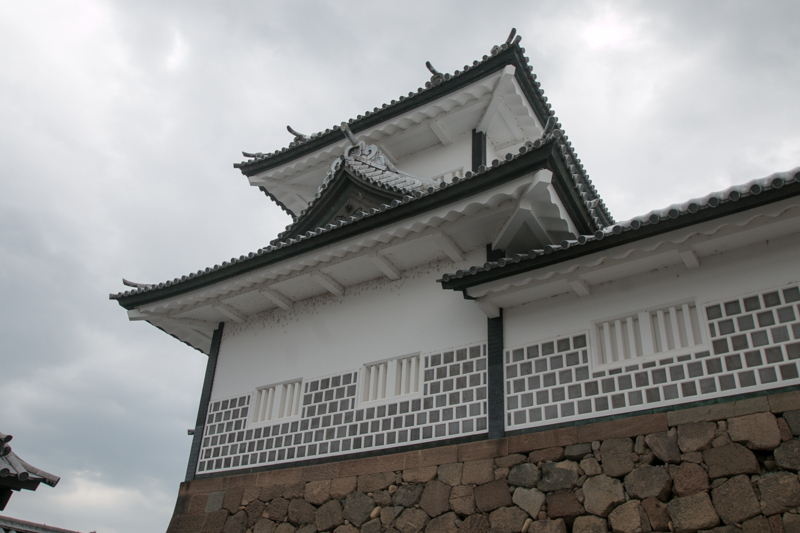 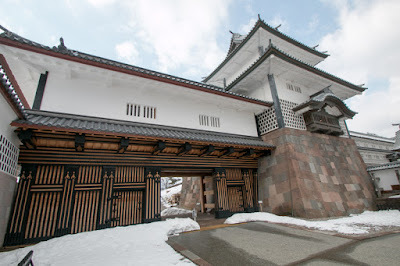 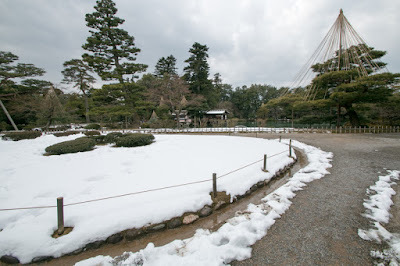 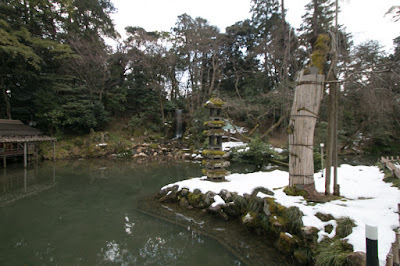 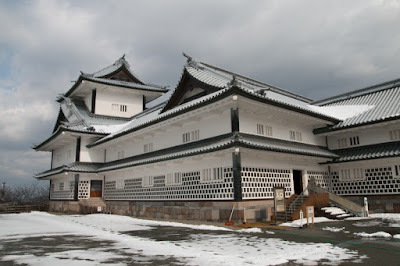 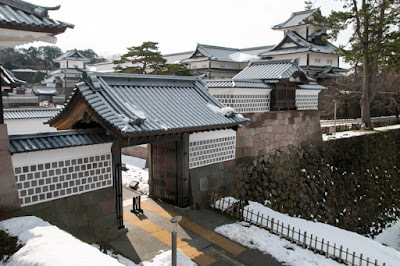 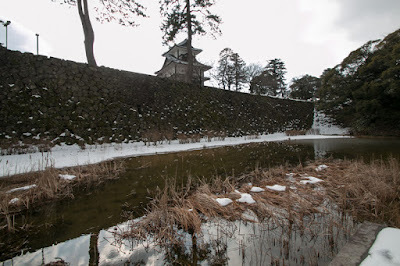 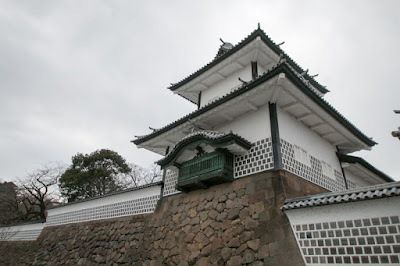 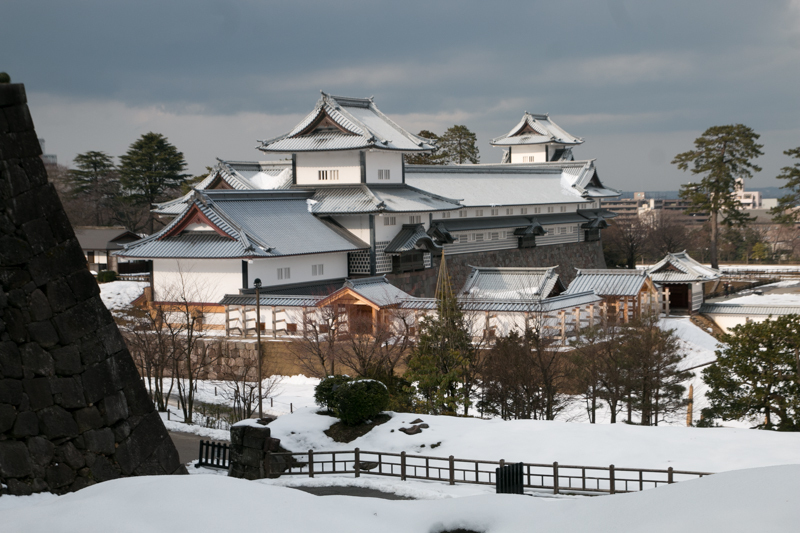 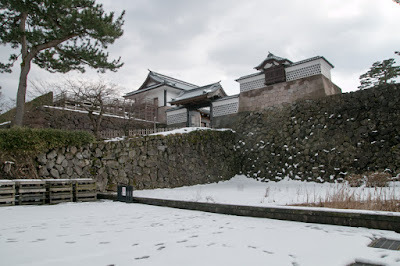 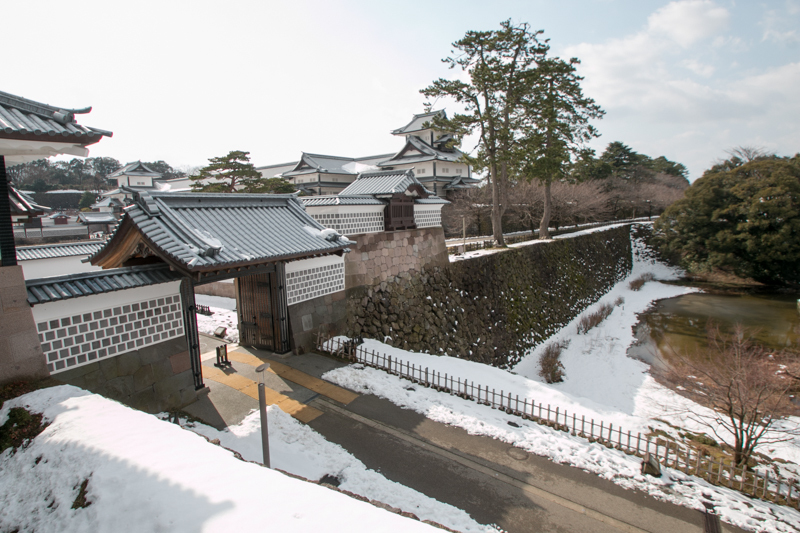 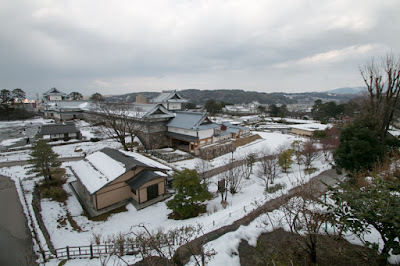 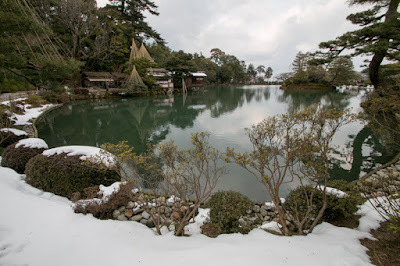 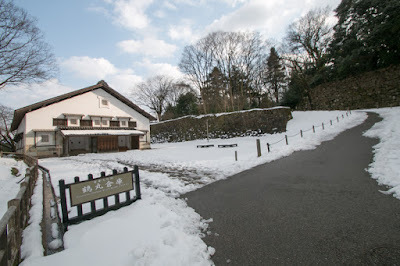 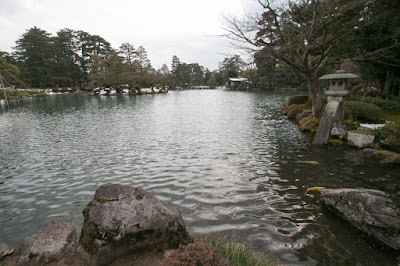 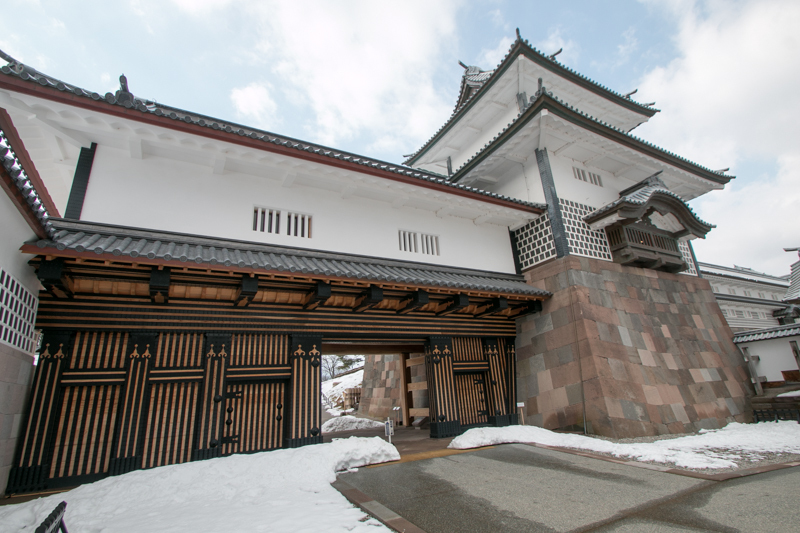 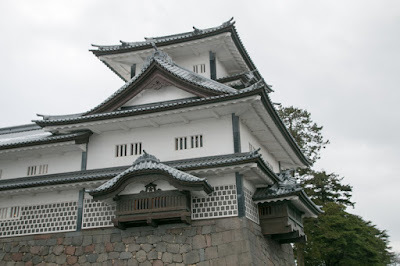 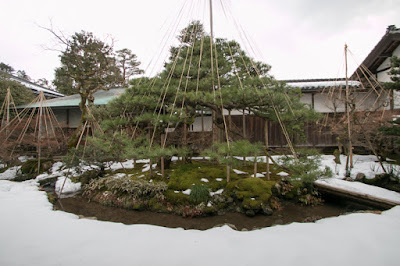 But Kanazawa city is located at the center of Hokuriku region and suitable place to connect major area of Hokuriku region, such as Toyama area, Nanao area and Fukui area, thus as a core of Hokuriku region Kanazawa city and Kanazawa castle prospered in Edo era. 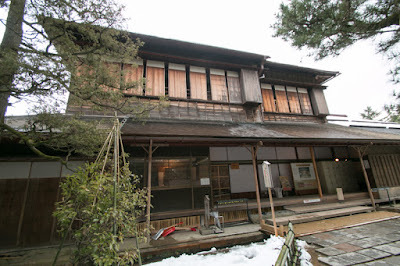 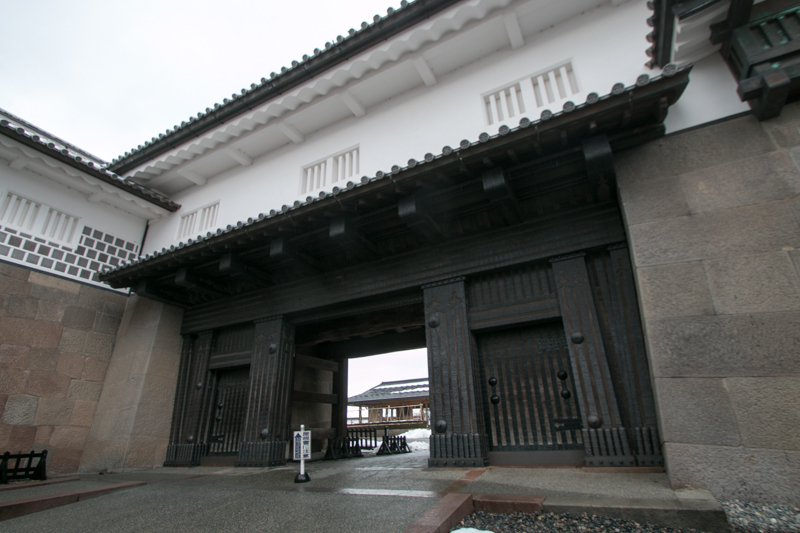 In Muromachi era, Kaga country was goverend by Togashi clan, the house of governor. 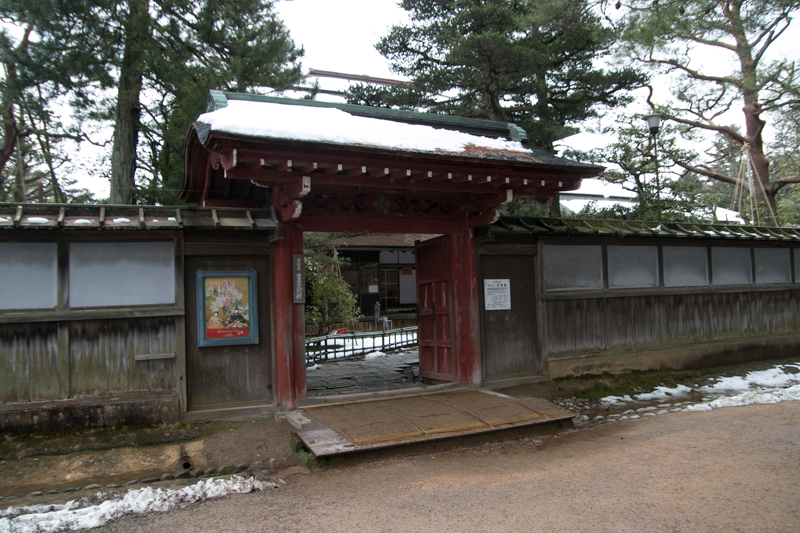 But at the middle of 15th century, Rennyo (1415-1499), a priest of Jyodosinshu (Ikkoshu), a denomination of Japanese Buddhism, resided Yoshizaki temple at the border of Echizen country (Fukui prefecture) and Kaga country for missionary. 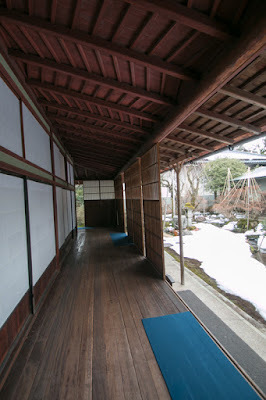 As Jyodoshinshu had a strong motive of relief and activity, thus among the chaos of the society Jyodoshinshu rapidly spread to Hokuriku region including Kaga country. 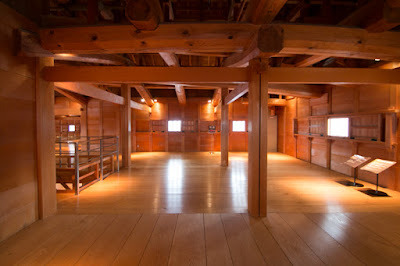 Ikkoshu group rose against rulers for 100 years and was called as Ikko Ikki. 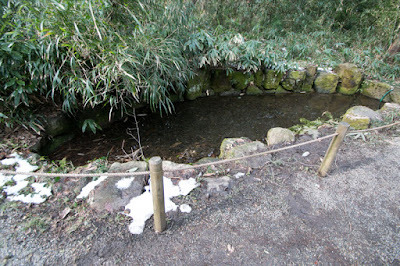 At the same time Togashi clan significantly lost their power by internal conflict. 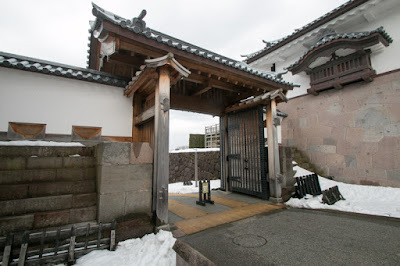 Masachika Togashi (1455-1488), leader of Togashi clan, asked the assistance of Ikko Ikki group to beat his rival, but after the battle Masachika who feared growth of Ikko Ikki turned to suppress them. 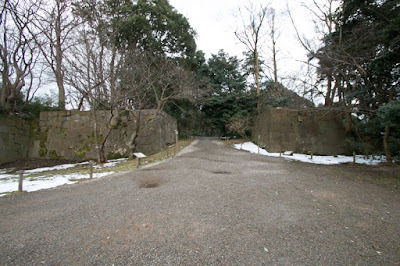 In addition to this, to finance military action in Kinki region, Masachika reaised taxes. 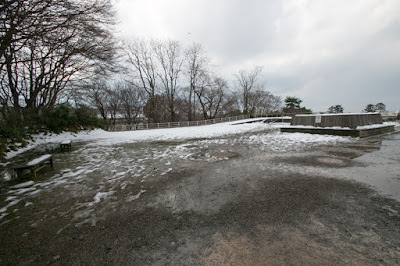 Facing this situation, Ikko Ikki rebellion occured and Masachika suisided at Takao castle in 1488. 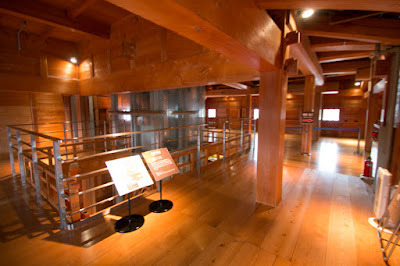 Kaga country wss said that the country of Ikko Ikki group, and since that over 100 years Ikko Ikki group managed Kaga country. 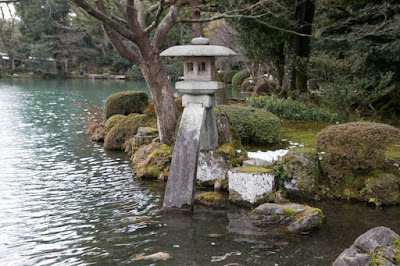 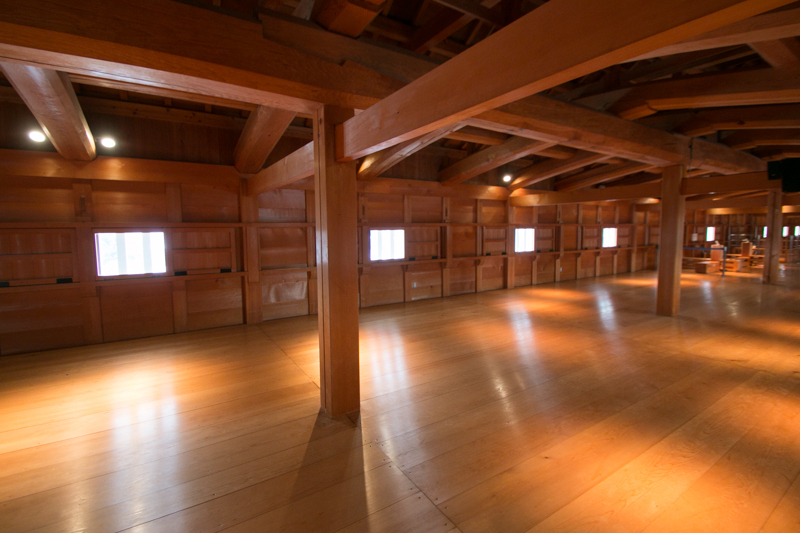 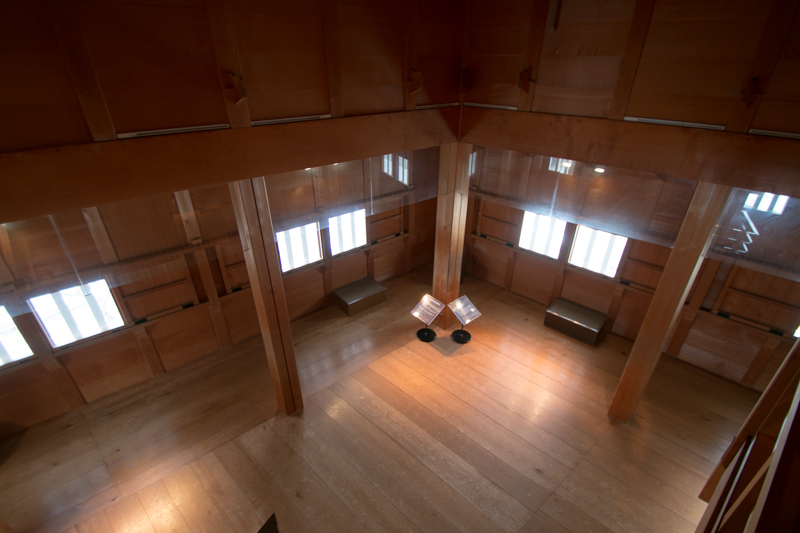 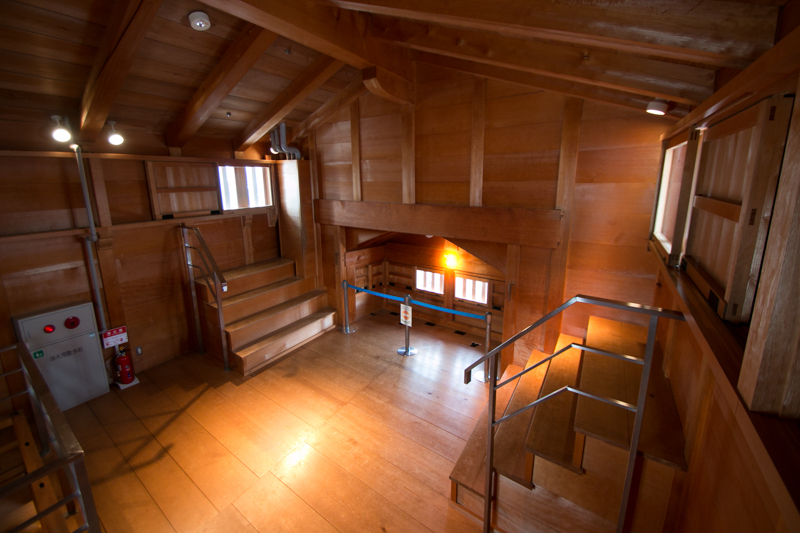 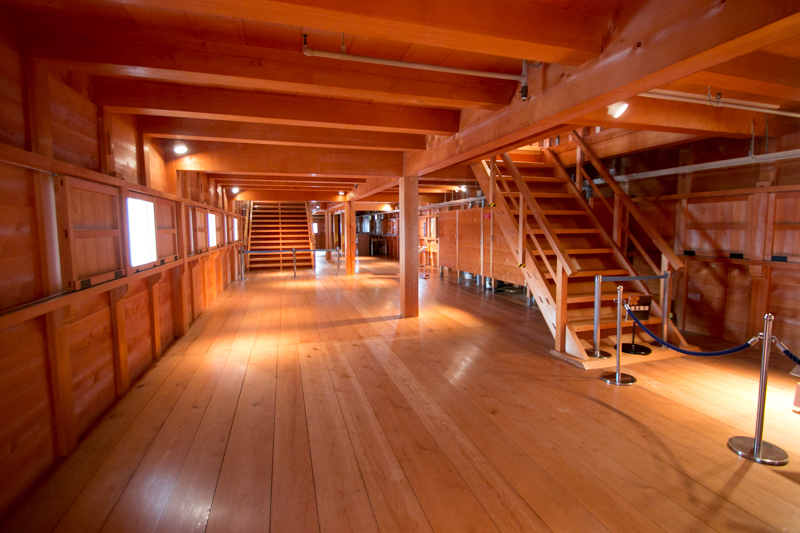 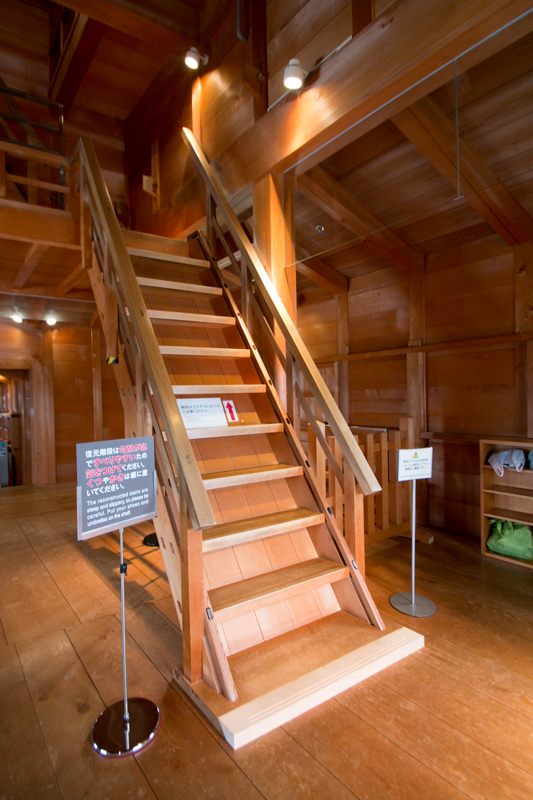 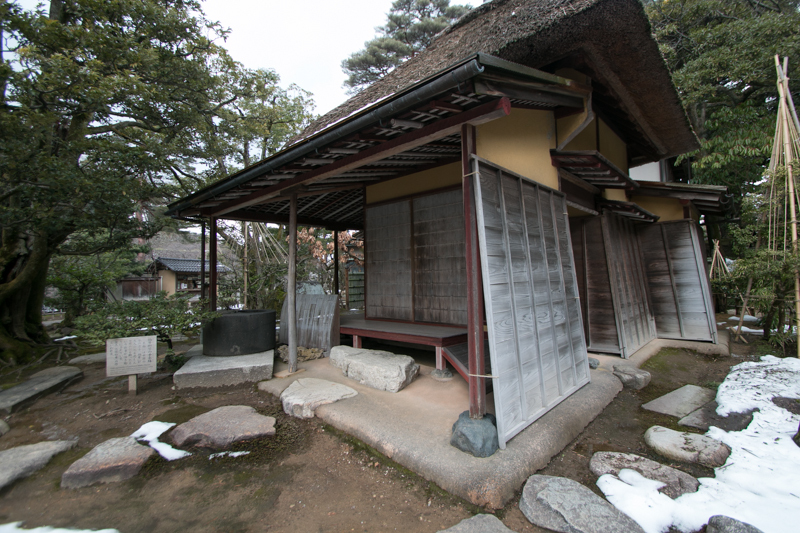 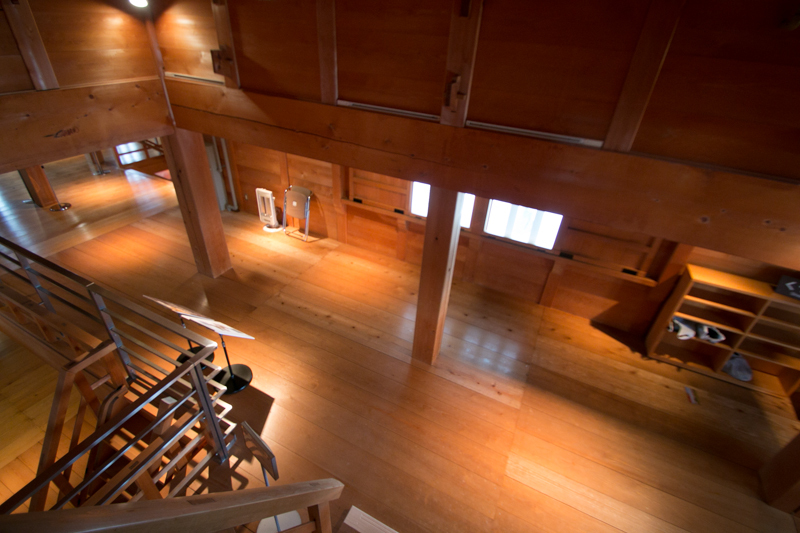 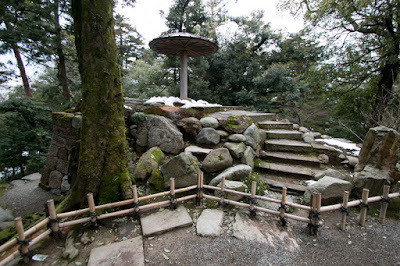 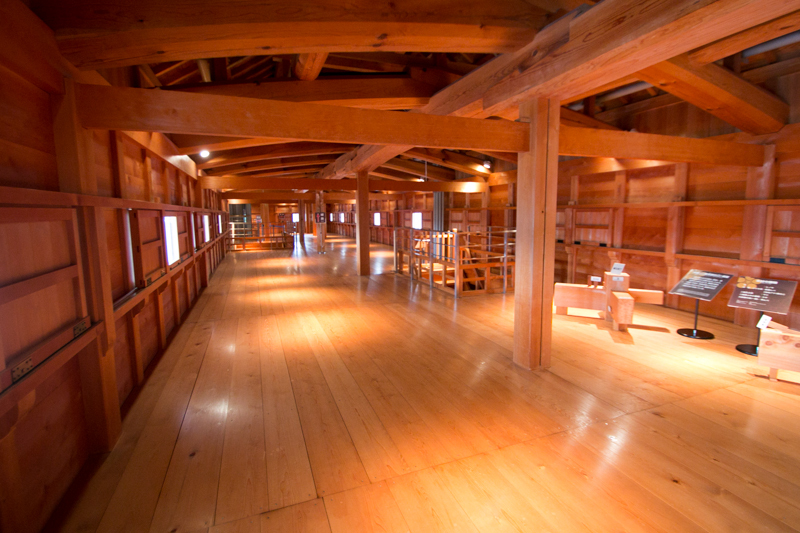 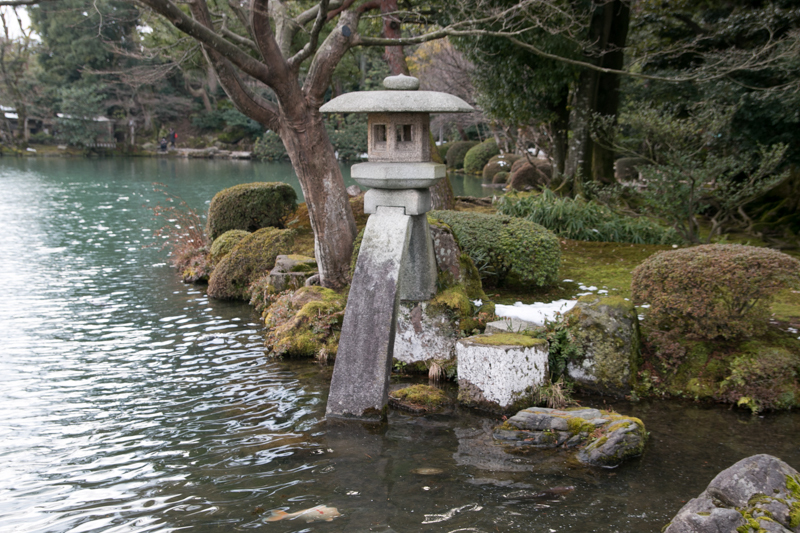 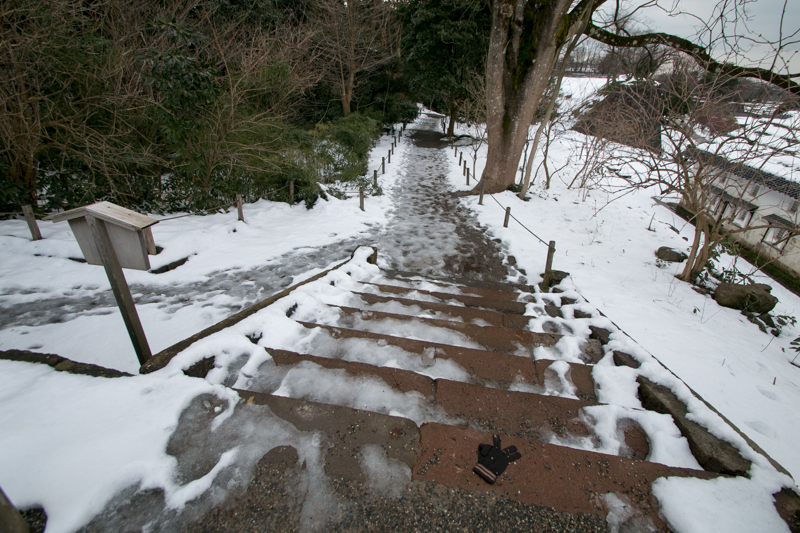 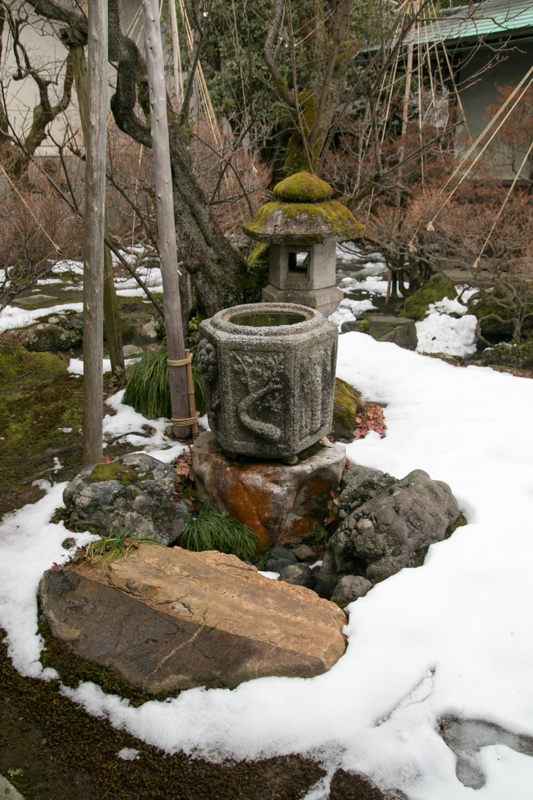 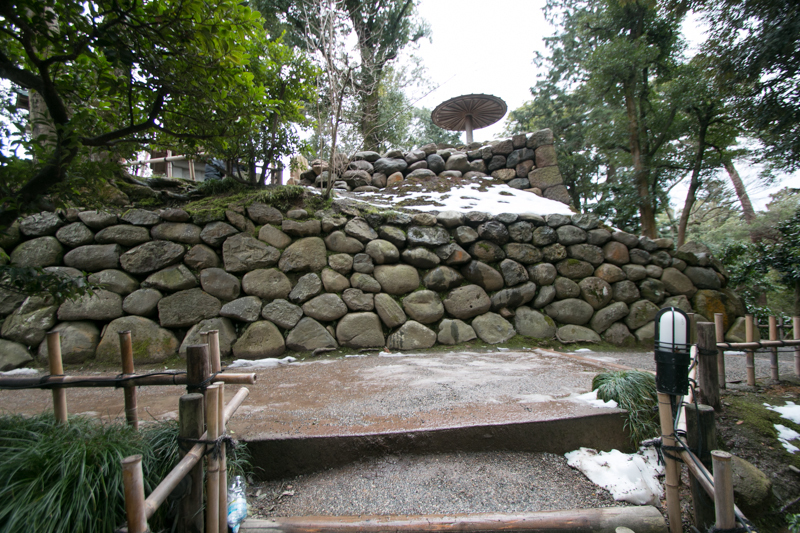 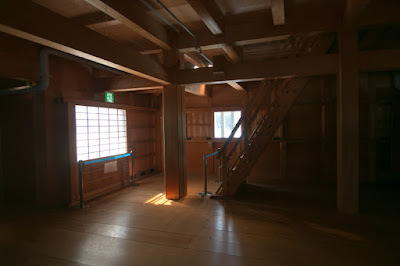 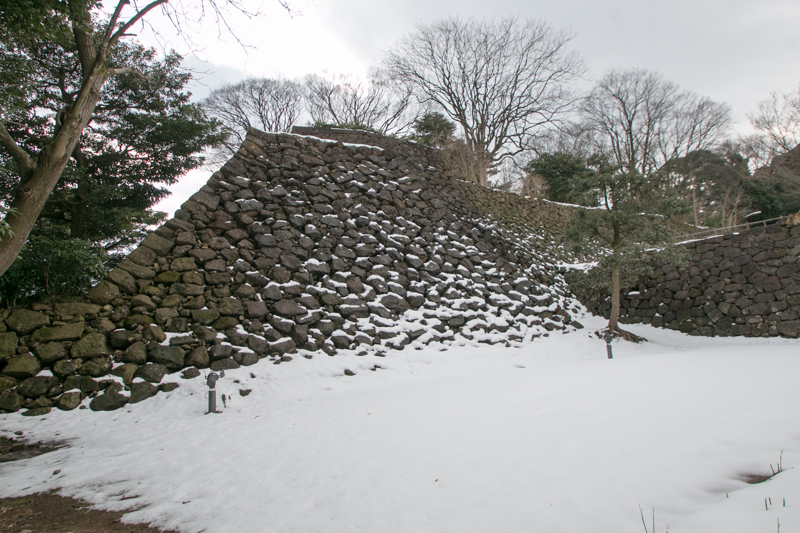 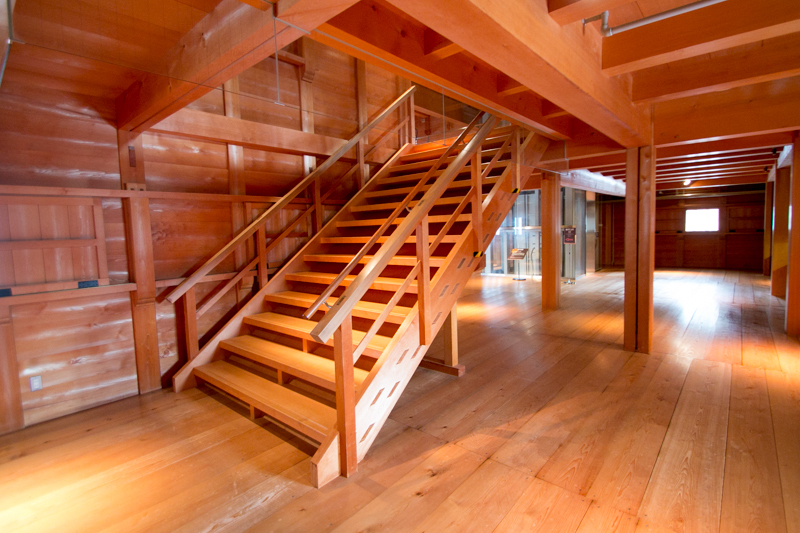 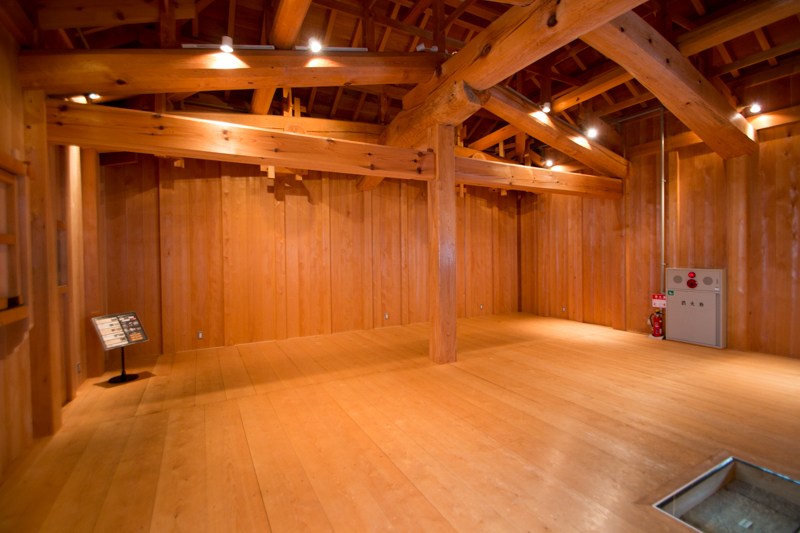 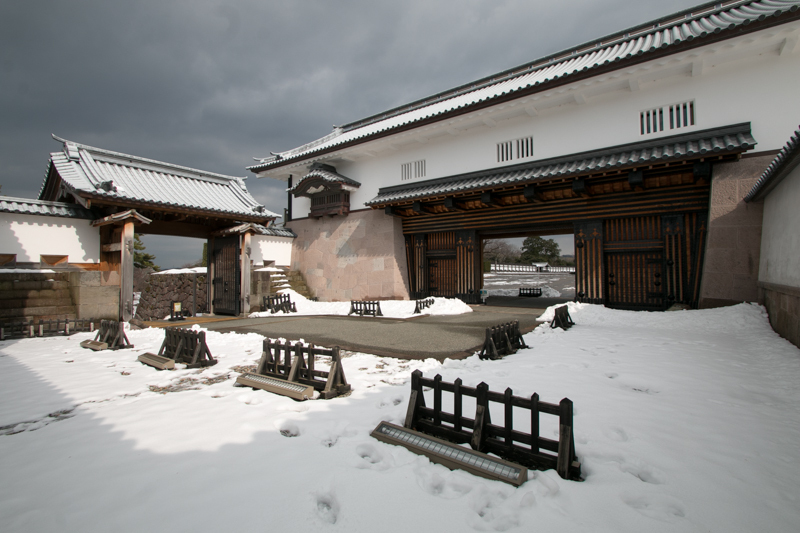 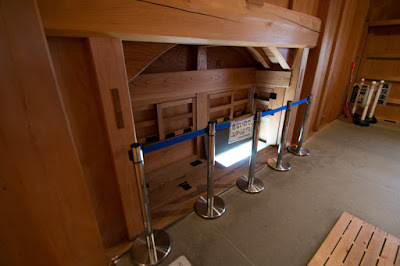 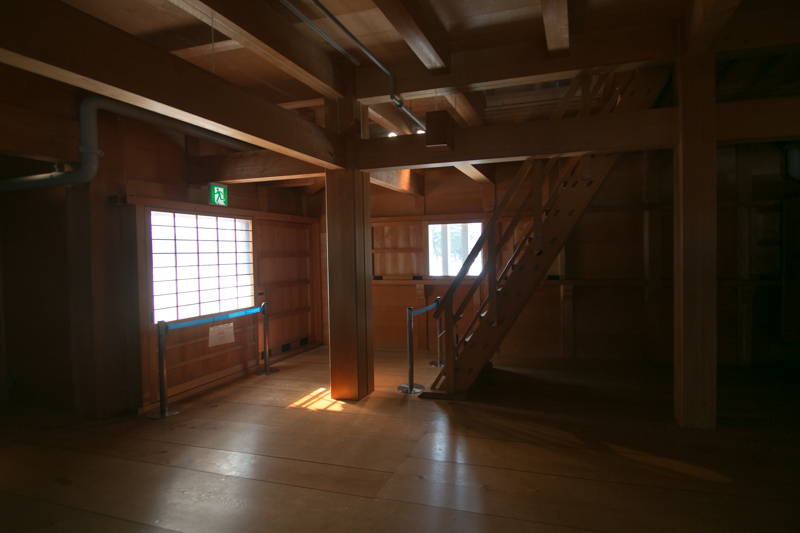 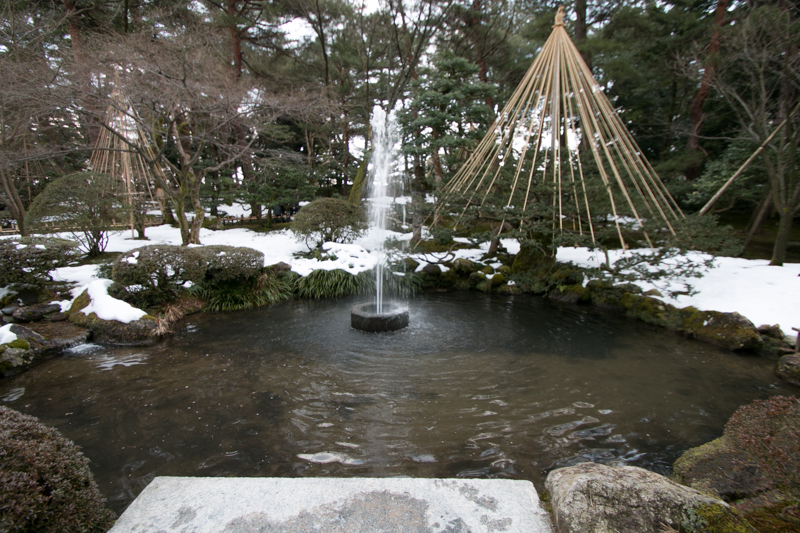 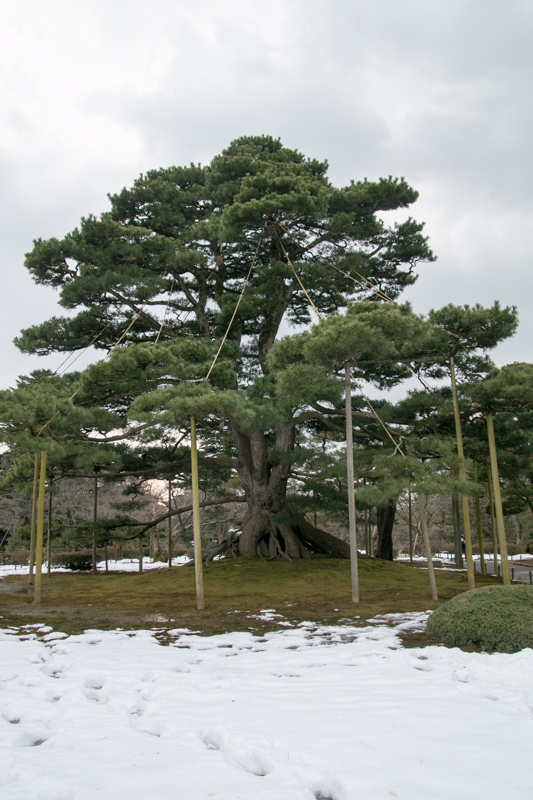 In 1546 Ikko Ikki group built their temple at the place of current Kanazawa castle and called it as Oyama Gobo. 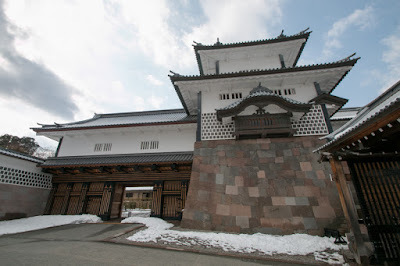 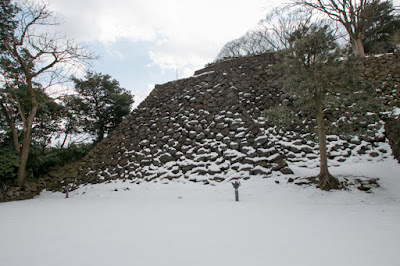 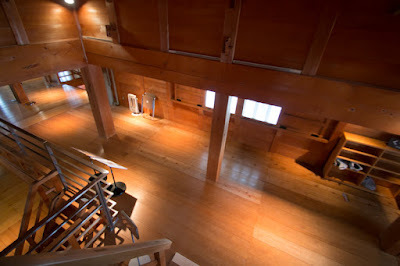 In addition to the secure place on the height, it was convenient place to communicate with companions at Noto country or Ecchu country (Toyama prefecture), and apart from Echizen country which was seized by strong warlord Asakura clan which beat Ikko Ikki several times. Temple town grew around the temple and it became the origin of current Kanazawa city. But Kaga country held by Ikko Ikki group was not necessarily a heaven. In addition to substantial conflict between local lords and people, Honganji temple, the main temple of Jyodoshinshu at Osaka, sent their magistrate and dominated the country. 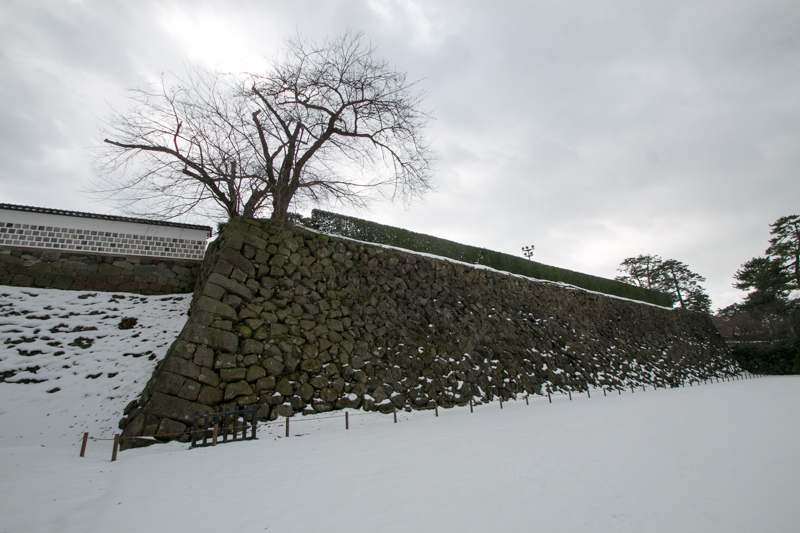 Under such situation, an internal conflict occurred around 1530 and this decreased the power of the group. Externally Ikko Ikki group assisted companions at Echizen country or Ecchu country, but these attempts failed due to the suppression of strong warlords such as Asakura clan or Uesugi clan. Around 1570, Ikko Ikki group became hostile against Nobunaga Oda (1534-1582), the central ruler who seized Kyoto city in 1568. 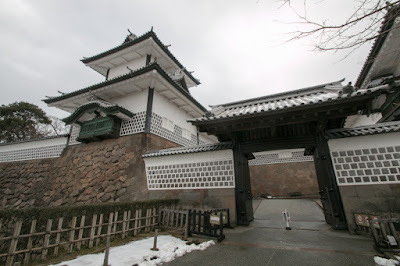 Kennyo (1543-1592), the leader of Ikko Ikki resided at Ishiyama Honganji (Osaka prefecture), tormented Nobunaga cooperating with other warlords many times. 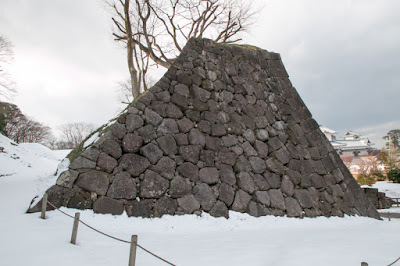 But Nobunaga stood these difficulties and crushed base of Ikko Ikki one by one. 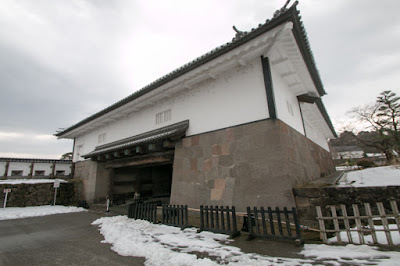 In 1575, Nobunaga destroyed Ikko Ikki at Nagshima area (Mie prefecture), located just next to his main territory Owari country (western half of Aichi prefecture). 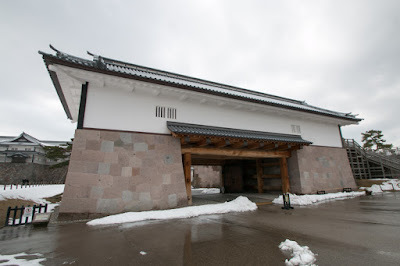 Same year, Nobunaga advanced to Echizen country, which was occupied by Ikko Ikki group after the fall of Asakura clan, and also anihilated Ikko Ikki group. 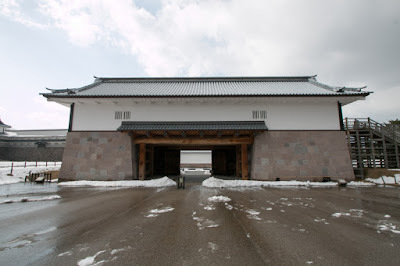 Facing this situation, Ikko Ikki group at Kaga country cooperated with Kenshin Uesugi (1530-1578), the warlord of Echigo country (Niigata prefecture) and resisted to Nobunaga. In 1577 Kenshin broke Katsuie Shibata (1522-1583), the regional commander of Nobunaga, at the battle of Tedorigawa river, but next year Kenshin died and Katsuie gradually proceeded to Kaga country from southward. In 1580, although Nobunaga made peace with Ishiyama Honganji, Katsuie captured Oyama Gobo and seized Kaga country. 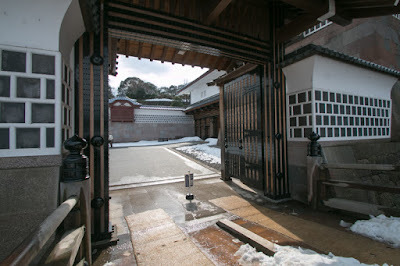 Katsuie gave Oyama Gobo to his nephew Morimasa Sakuma (1554-1583). Morimasa reformed Oyama Gobo into a castle and named as Kanazawa castle. Katsuie smoothly expanded his territory into Noto country or Ecchu country fighting against Uesugi clan, but in 1582 June his master Nobunaga died at the incident of Honnoji, a coup d’etat by his commander Mitsuhide Akechi (1528-1582). 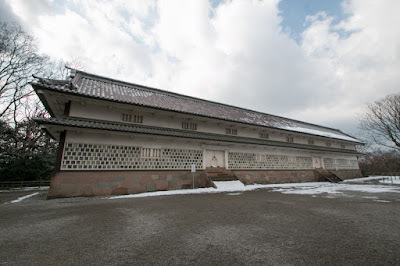 Due to the conflict with Uesugi clan and fear of rebellion of Ikko Ikki, Katsuie had to secure existing territories, and amont that Hideyoshi Hashiba (1538-1598), another regional commander of Nobunaga, came back from western front and made revenge to Mitsuhide at the battle of Yamazaki. Next year Katsuie and Hideyoshi fought at Shizugatake (Shiga prefecture) for the position of successor of Nobunaga. 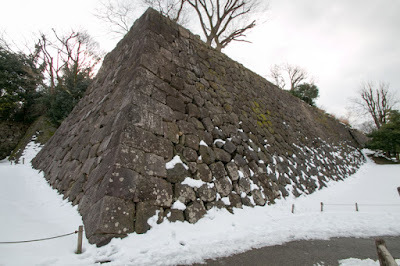 Among the absence of Hideyosyi, Morimasa assaulted the fort of Hideyoshi army and defeated troops.But this was a trap of Hideyoshi to lure Shibata army from fort, and returned Hideyoshi stroke Shibata army with larger force. 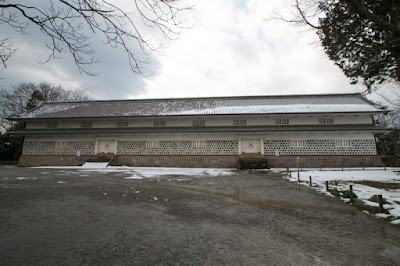 Shibata army once stood but Toshiie Maeda (1538-1599), general of Katsuie but who was the friend of Hideyoshi, suddenly left the battlefield. 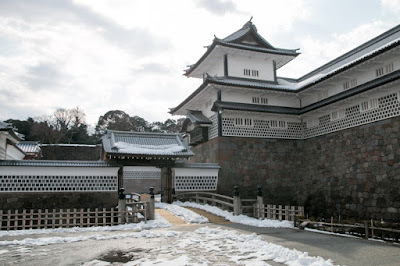 Seeing that Shibata army collapsed, and Katsuie ran away to his residence Kitanosho castle (Fukui prefecture) and suicide there. 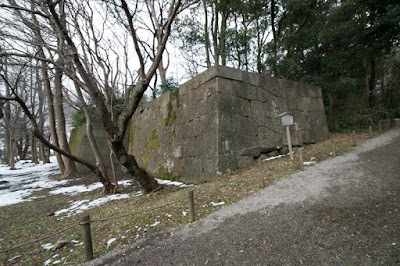 Morimasa was also captured by Hideyoshi and executed. After the fall of Katsuie, Hideyoshi gave Kaga country to Toshiie, along with Noto country already held by Toshiie. 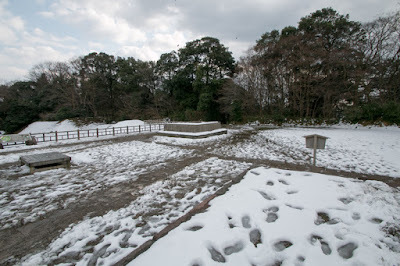 Toshiie was originally a son of small lord at Owari country, and served to Nobunaga from youth. 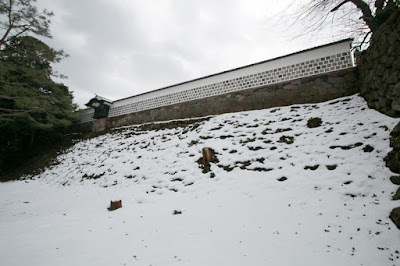 He was a favorite of Nobunaga ane became the guard, but one day Toshiie killed a relative of Nobunaga who insulted Toshiie and left Oda clan. Several year Toshiie wandered in poverty, and voluntary participated in the battle of Nobunaga and made achievement, then finally returned as a retainer of Nobunaga. 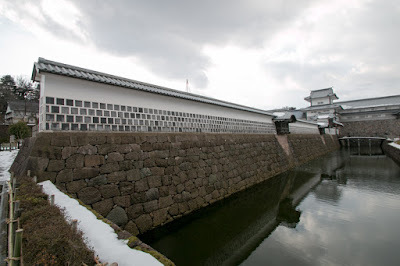 Toshiie married with his cousin Matsu (1547-1617, Houshunin), and his family had a friendship with the family of later ruler Hideyoshi Kinoshita (1537-1598, later Hideyoshi Toyotomi) and One (1547-1624, Kitanomandokoro). 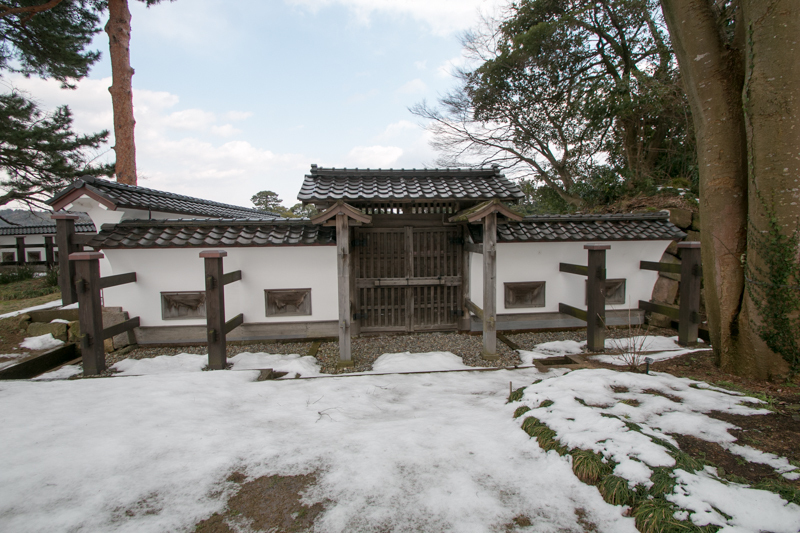 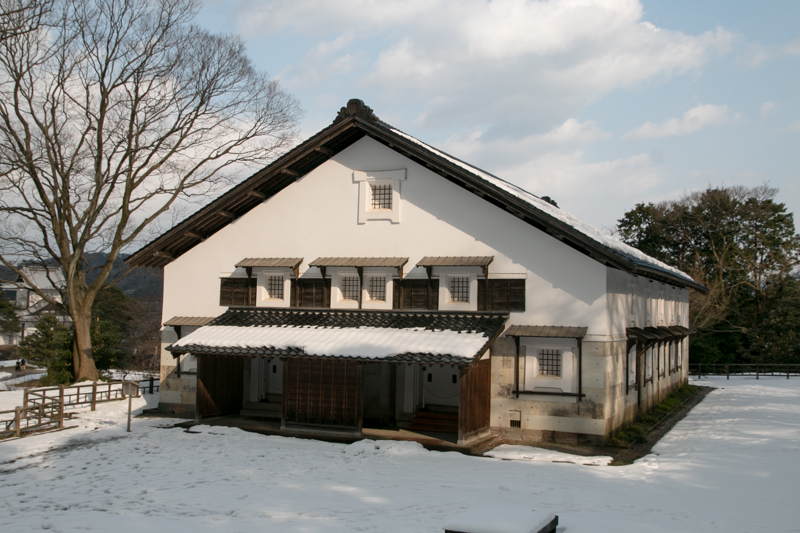 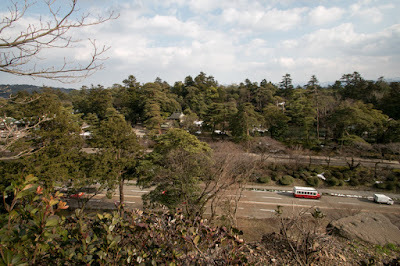 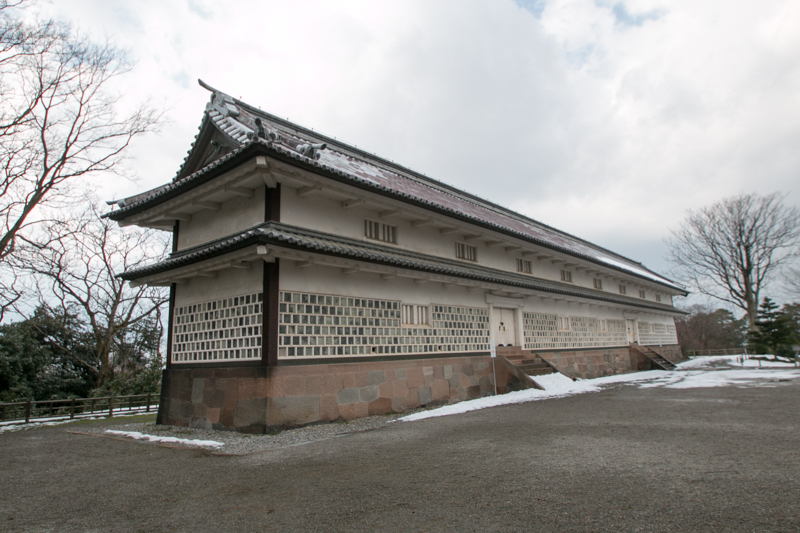 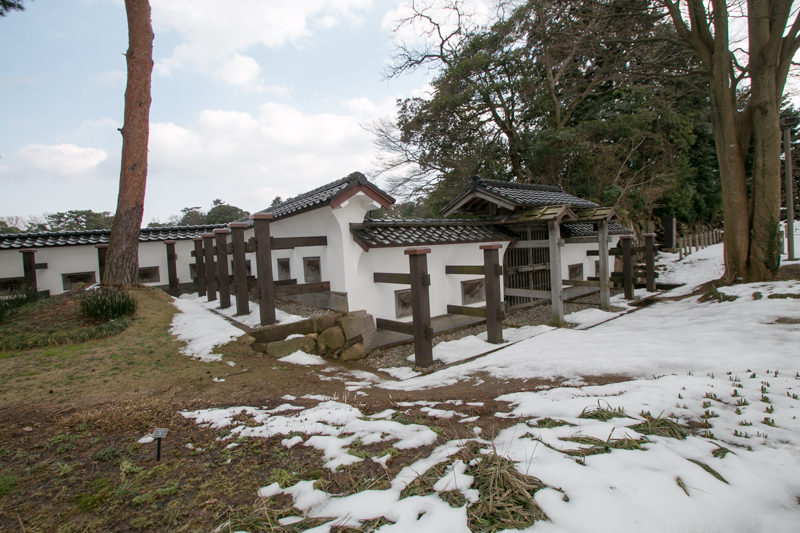 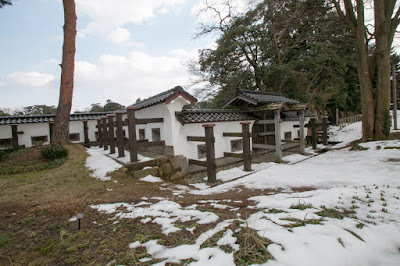 These two families lived next at castle town of Komaki castle (Aichi prefectuer), and across the road at Azuchi castle (Shiga prefecture), and two wives frequently visited to each other. 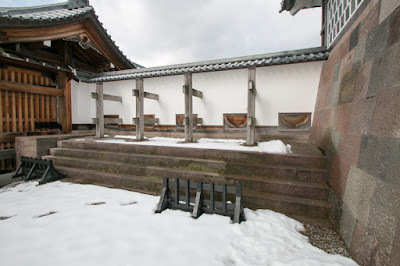 Both Toshiie and Hideyoshi experienced difficulty in youth, and they did not directly compete for promotion because Toshiie was a commander of direct force who was good at commanding and Hideyoshi was a lord who had a sense of politics. 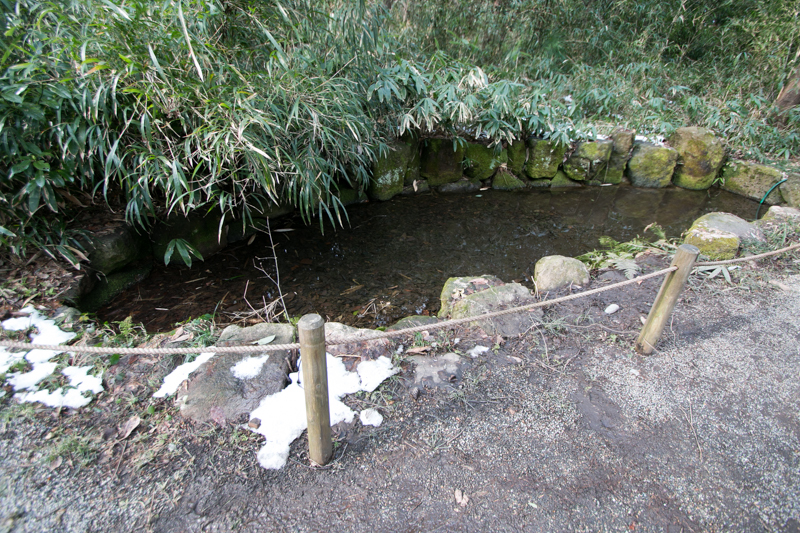 Toshiie was good at spear and called as “Mataza (middle name of Toshiie) of spear”. 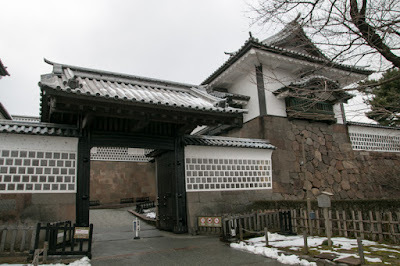 Under Nobunaga, Toshiie promoted to the commander of his direct force named “Akahoroshu” (red cape force), along with Narimasa Sasa (1536-1588) who became the commander of “Kurohoroshu” (black cape force). Toshiie activated at many battles such as the battle of Nagashino in 1575 as a commander of masket gunners. In 1575, Katsuie Shibata was appointed as a regional commander of Hokuriku region, and Toshiie was attached to Katsuie as a commander, along with Narimasa and Mitsuharu Fuwa. 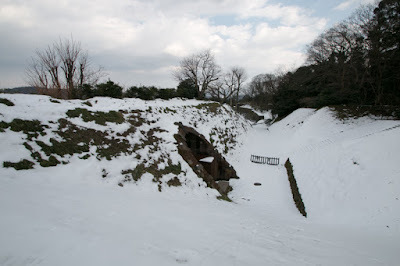 Toshiie became the lord of Fuchu castle (Fukui prefecture) , and assisted military operations of Katsuie. Along with the processing of expansion, in 1581 Toshiie became the lord of Noto country. 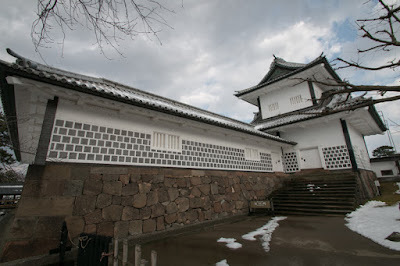 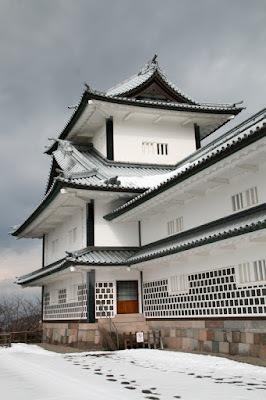 At first Toshiie used Nanao castle, but newly built Komaruyama castle near the port and moved. 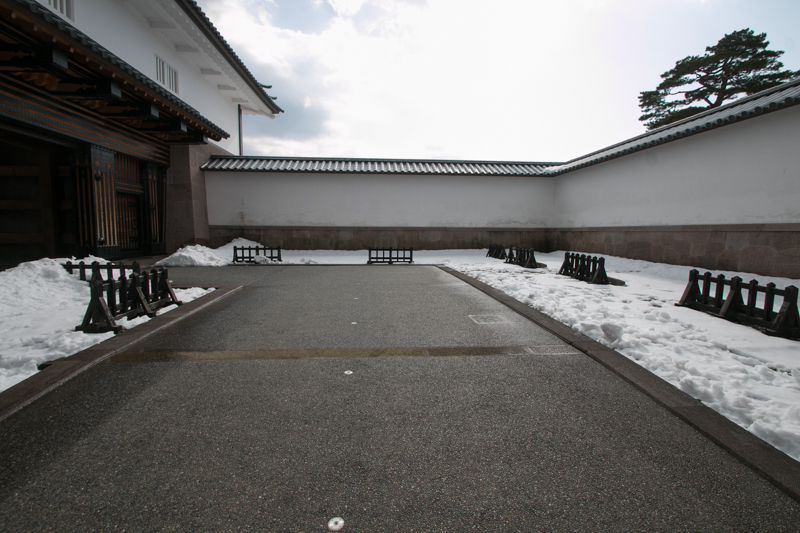 After the death of Nobunaga, Toshiie was involved in the battle between his master Katsuie Shibata and his friend Hideyoshi Toyotomi. 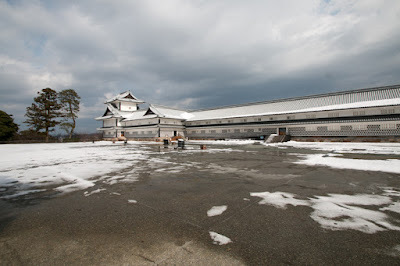 Toshiie participated in the battle of Shizugatake as a commander of Katsuie but might be persuaded by Hideyoshi to support him in advance. As a result, Toshiie left the battlefield without fighting against Hideyoshi and this lead to the collapse of Shibata army. After the battle Katsuie ran away from battle field toward his residence Kitanosho castle visited Fuchu castle where Toshiie stayed. 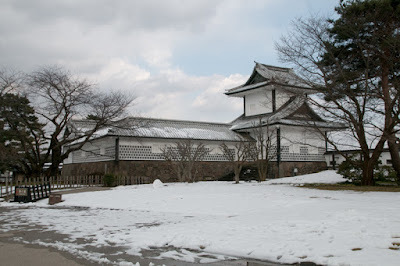 Toshiie served meal to Katsuie, and Katsuie did not blame the betrayal of Toshiie and released the daughter of Toshiie who was kept as hostage. 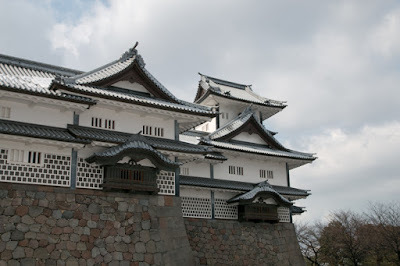 Just after that Hideyoshi also visited Fuchu castle, and due to entreat from Matsu, Hideyoshi forgave Toshiie and attacked Kitanoshio castle. After the battle, Hideyoshi gave Kaga country to Toshiie. 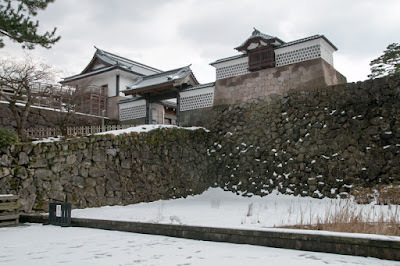 Further in 1585, Narimasa Sasa who kept Ecchu country opposed to Hideyoshi and lost Ecchu country, then Hideyoshi also leave Ecchu country to Toshiie. 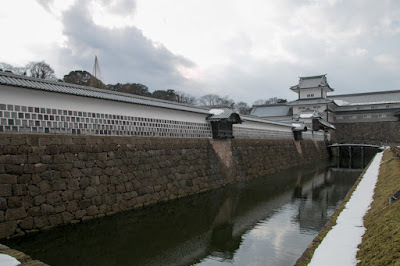 Now Toshiie became one of the largest lord of Toyotomi government. Hideyoshi expected Toshiie as a counter power against Ieyasu Tokugawa (1543-1616), the largest lord under Hideyoshi, and later nominated Toshiie as one of the grand minister of Toyotomi government, along with Ieyasu and other large lords. 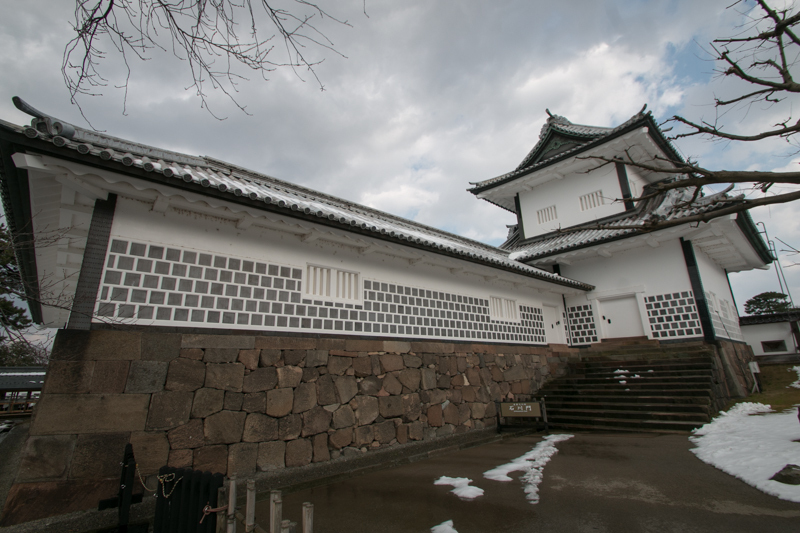 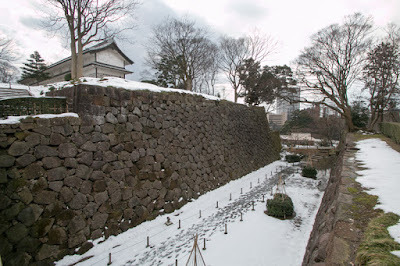 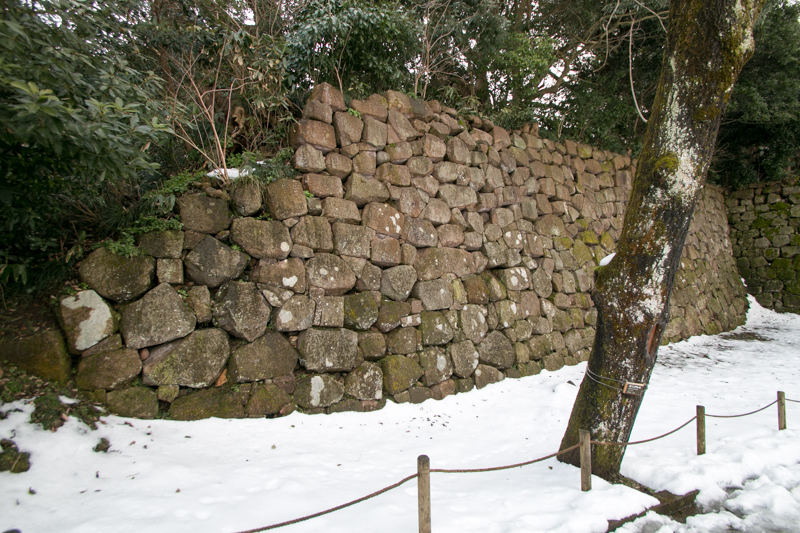 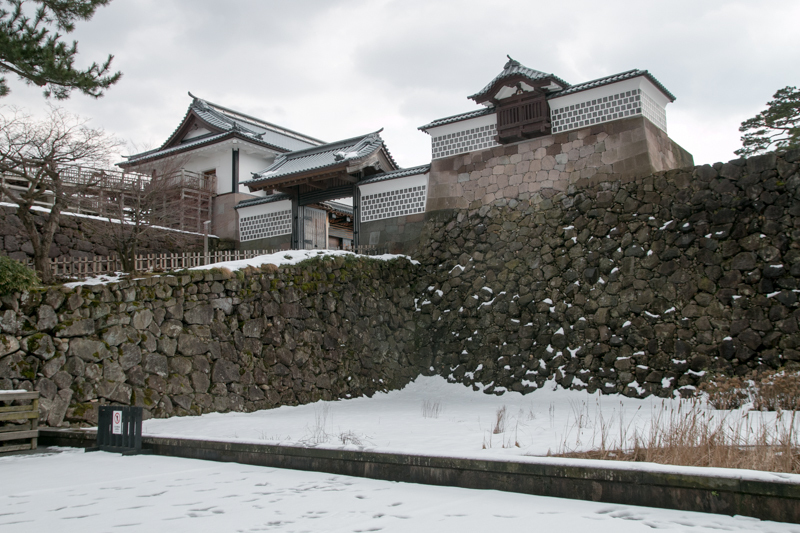 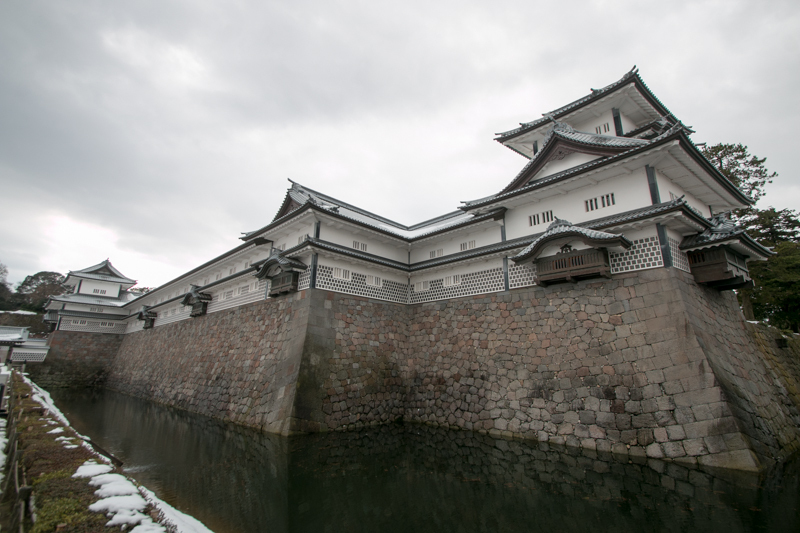 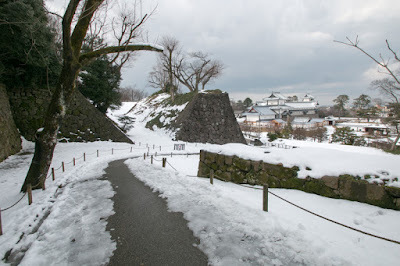 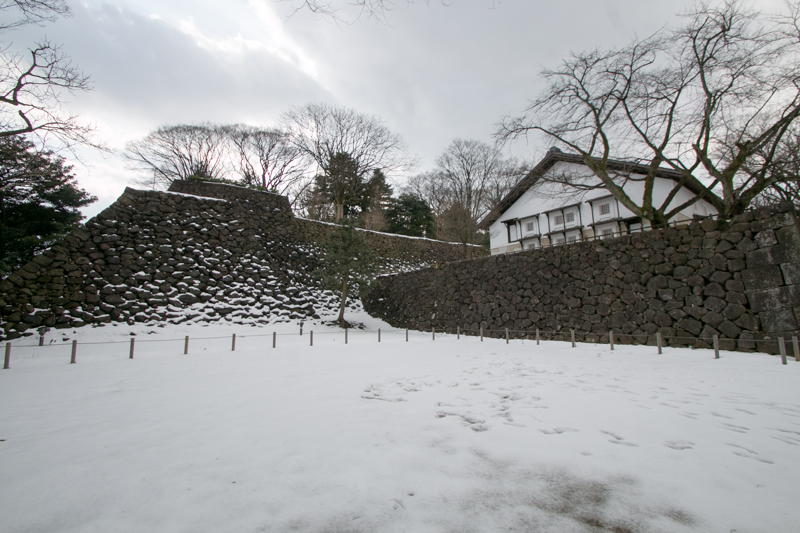 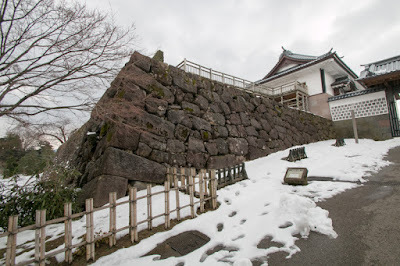 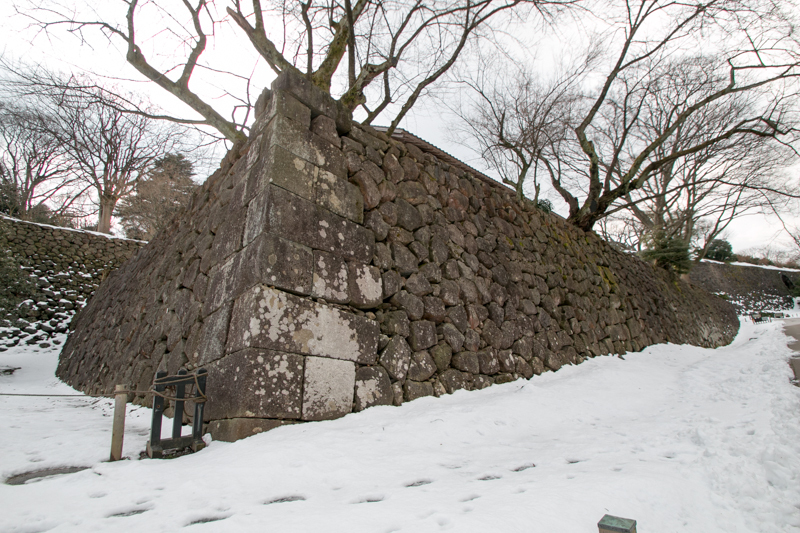 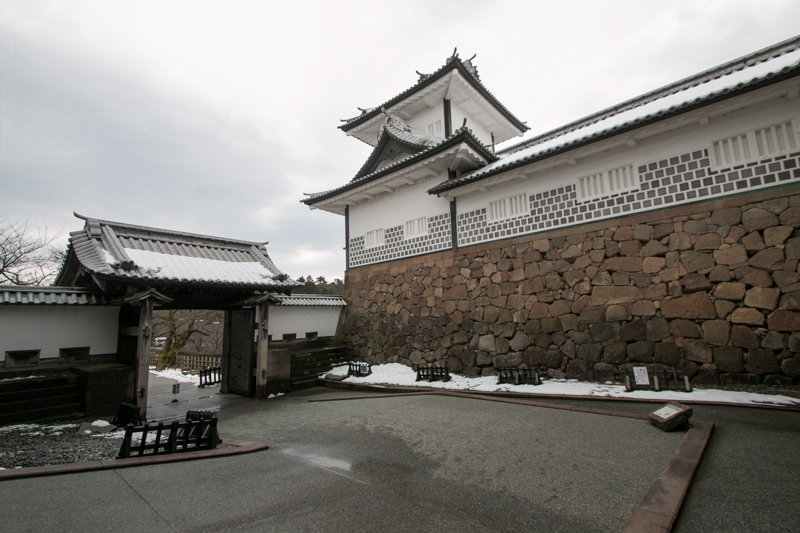 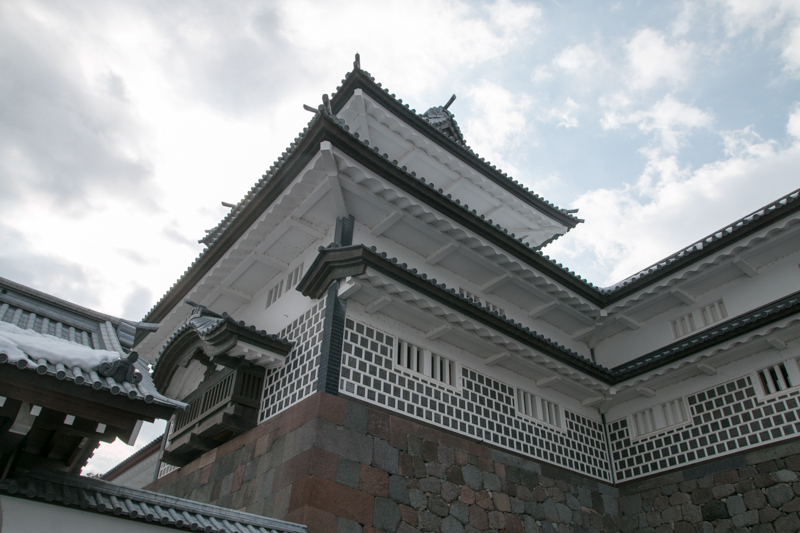 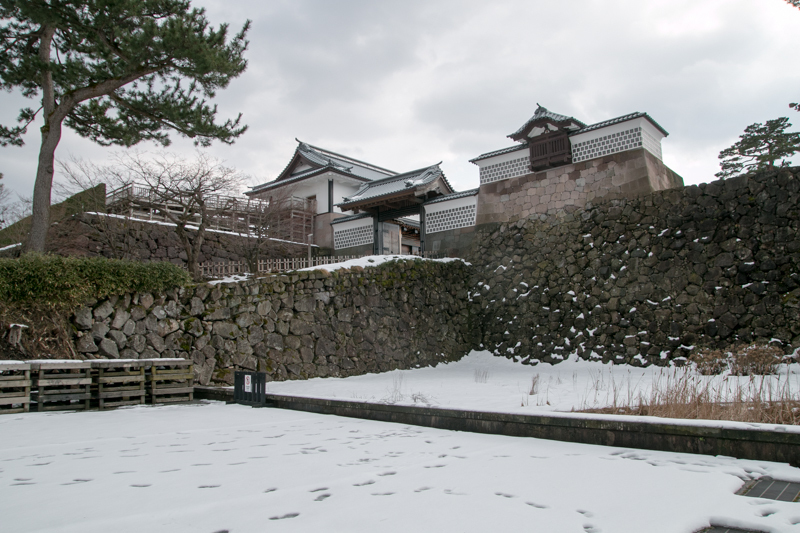 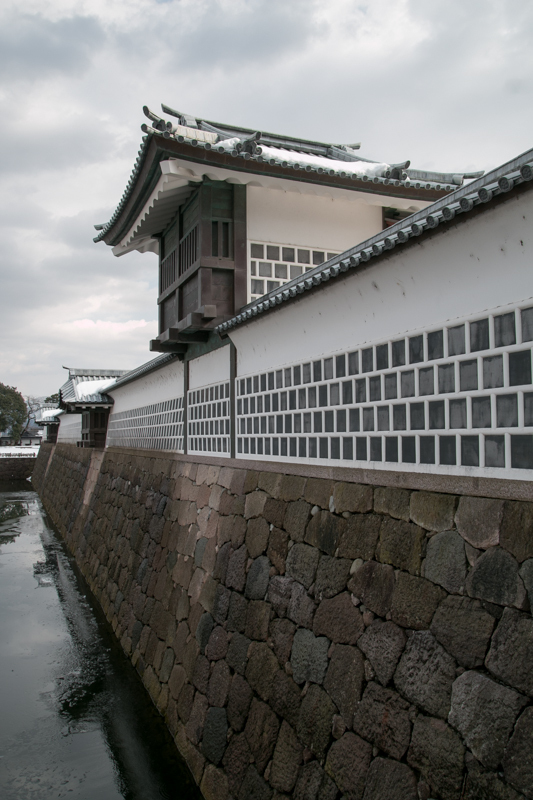 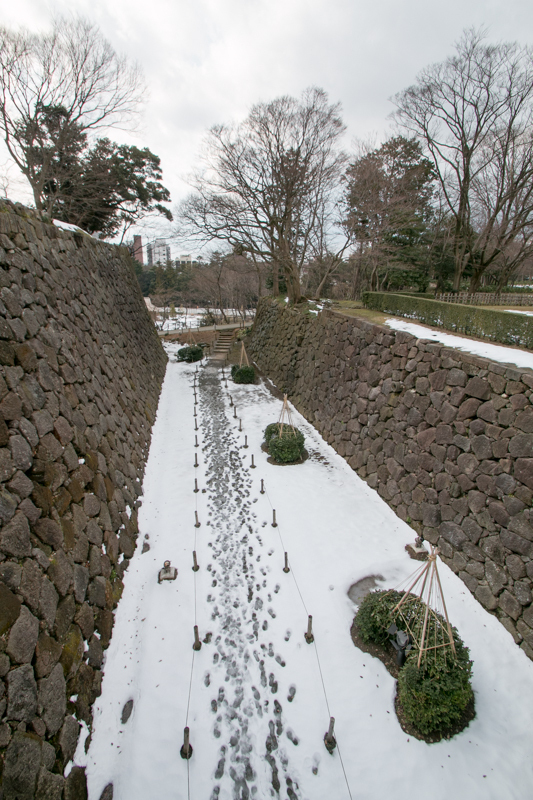 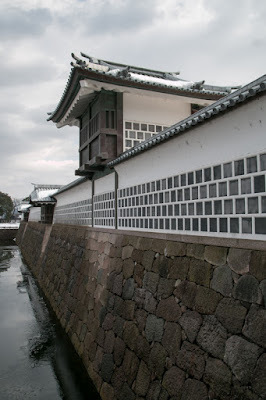 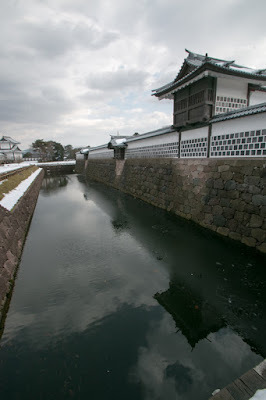 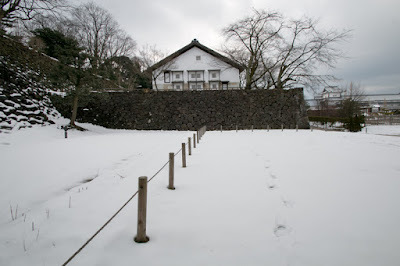 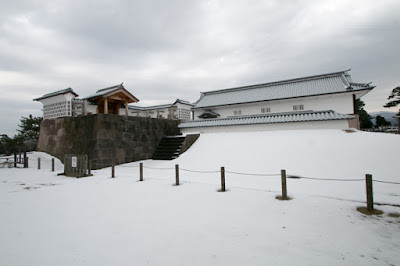 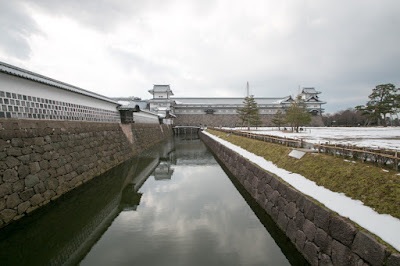 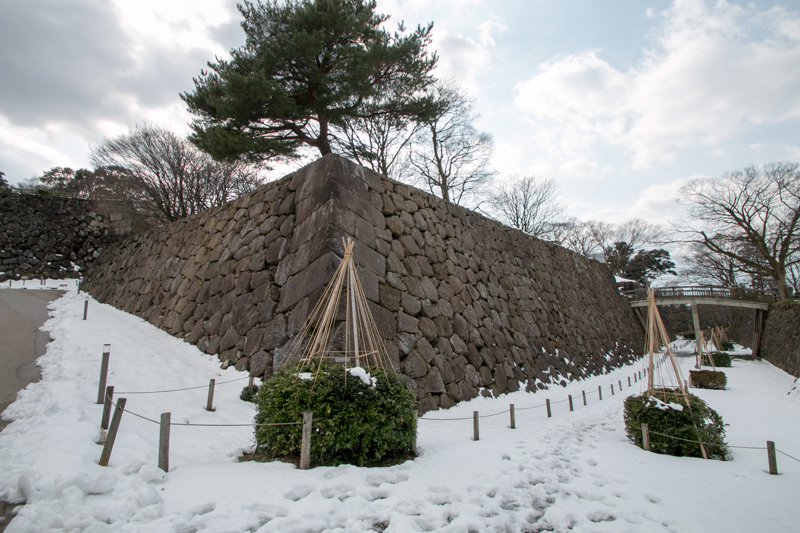 Around 1590’s, Toshiie significantly reformed Kanazawa castle as a residence of large lord. 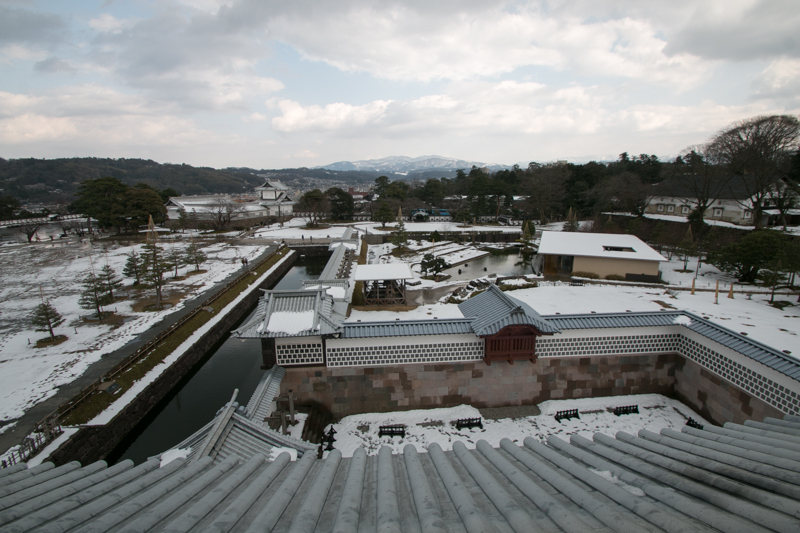 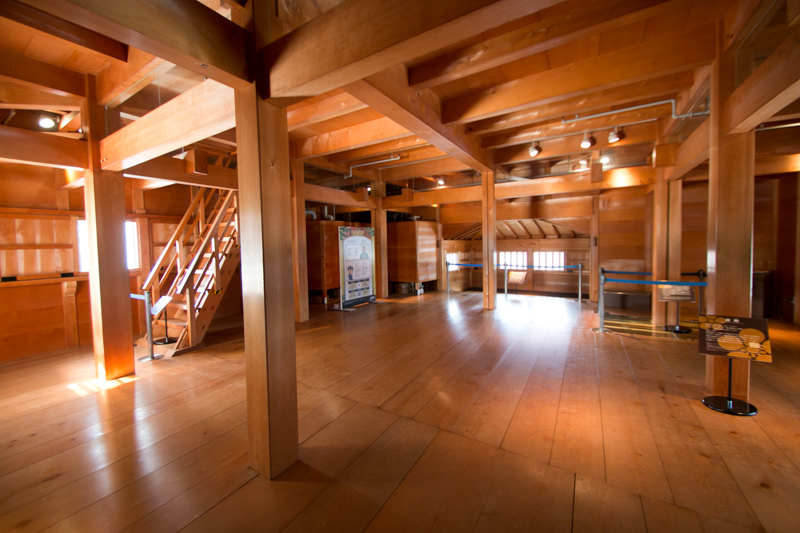 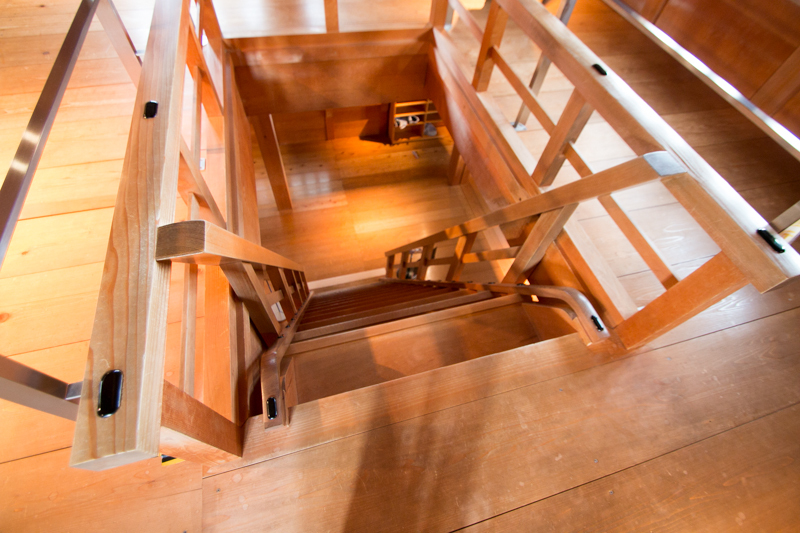 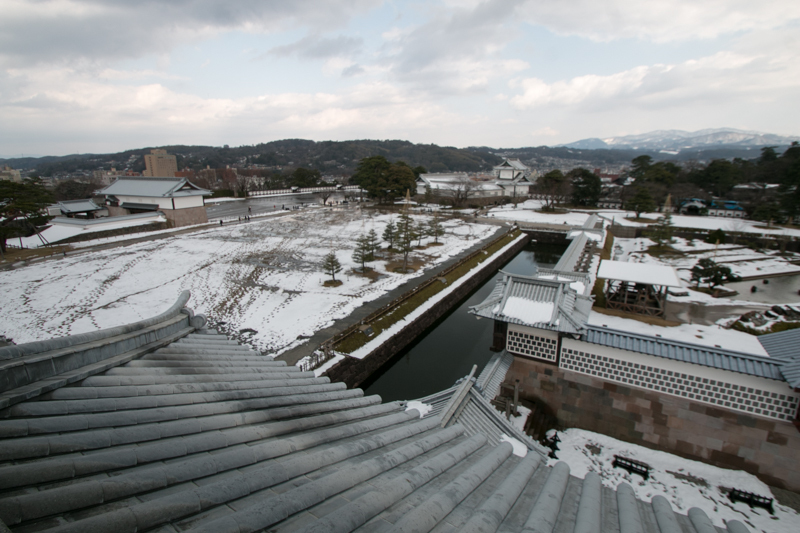 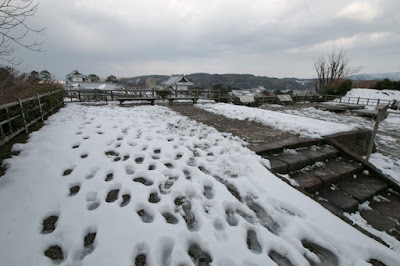 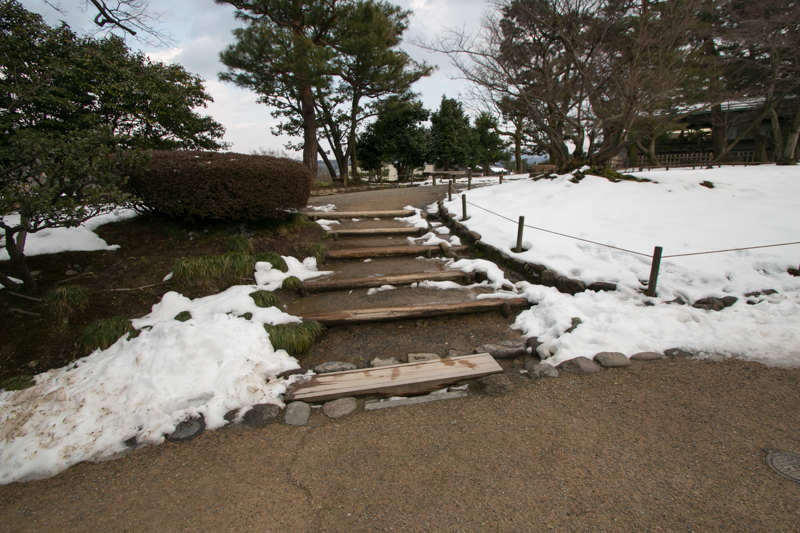 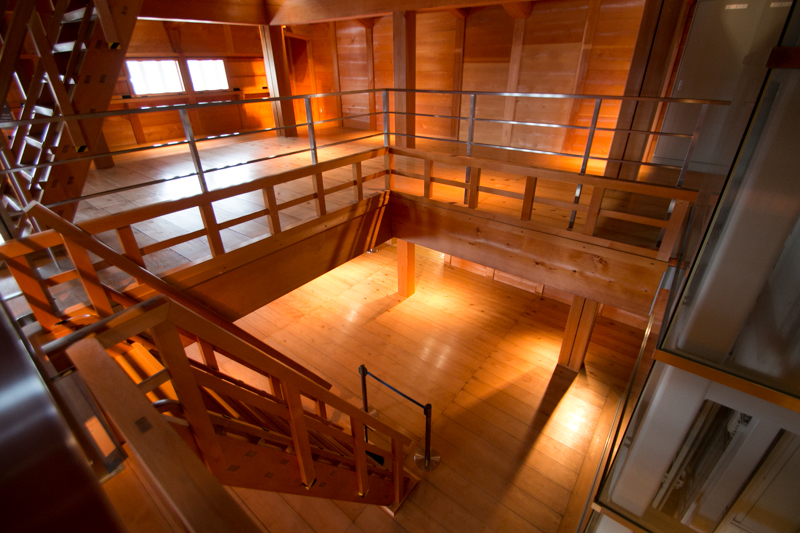 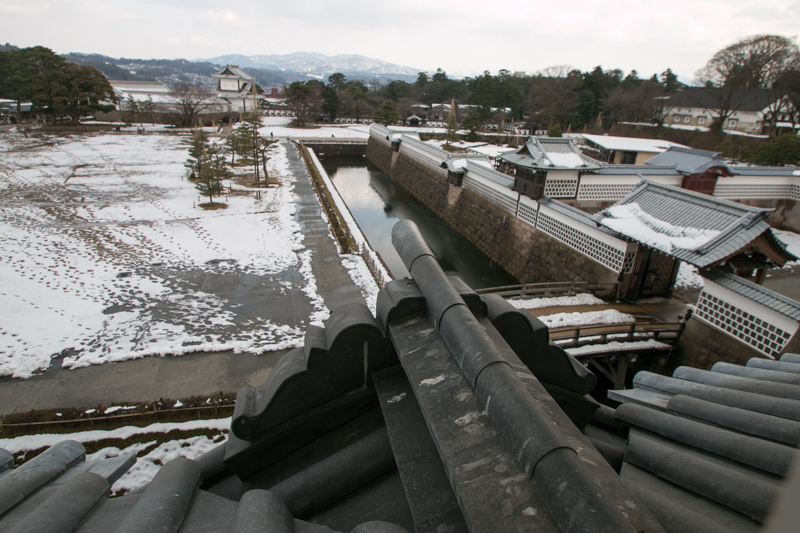 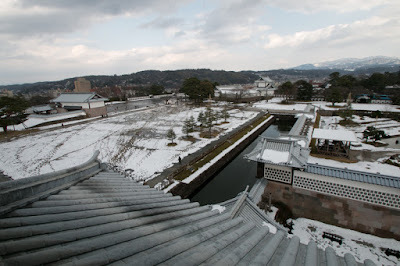 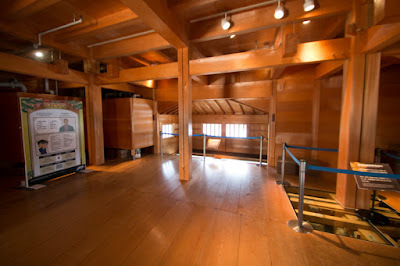 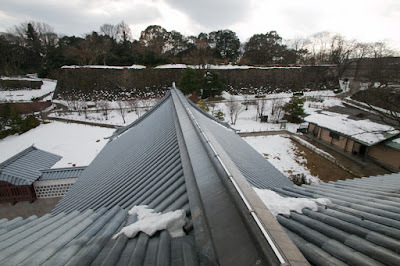 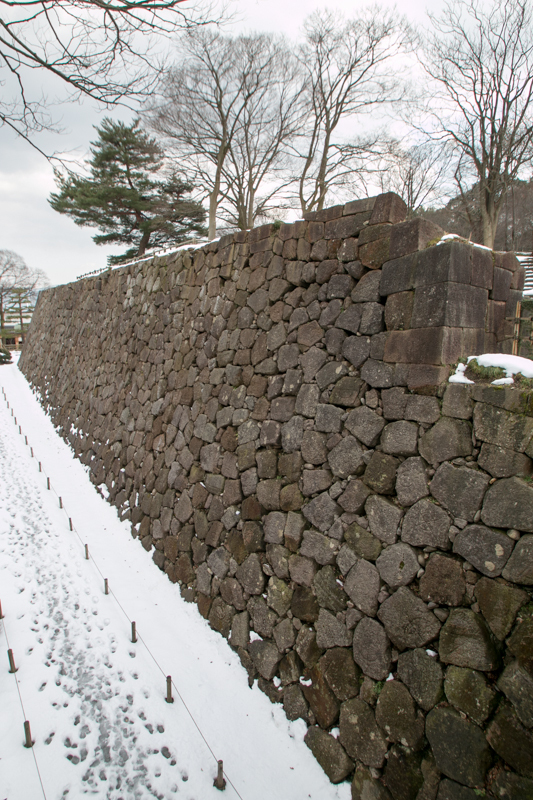 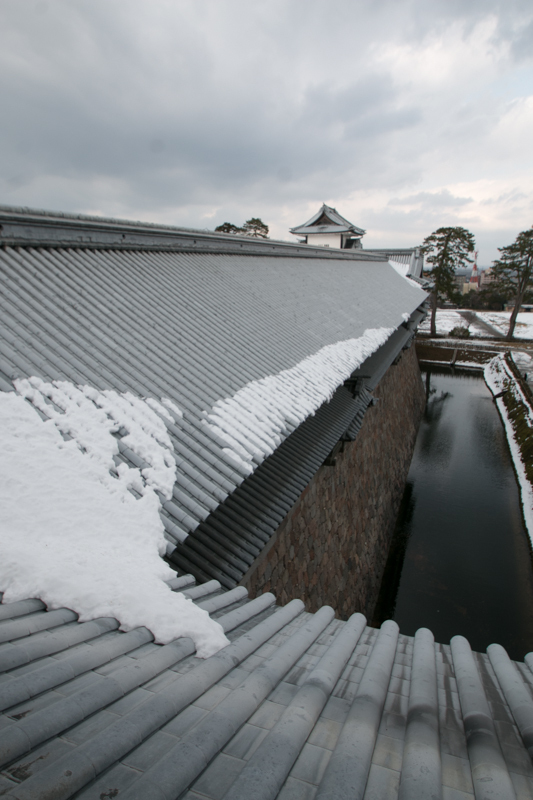 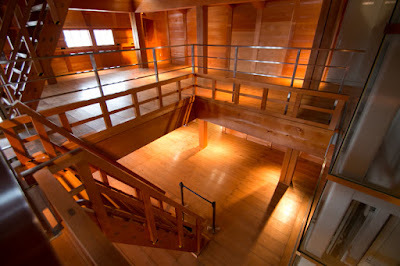 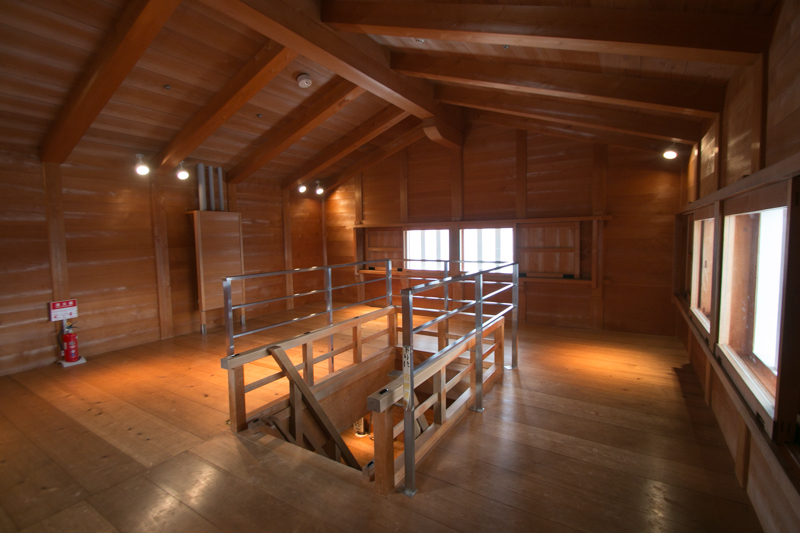 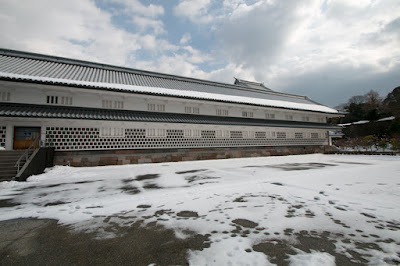 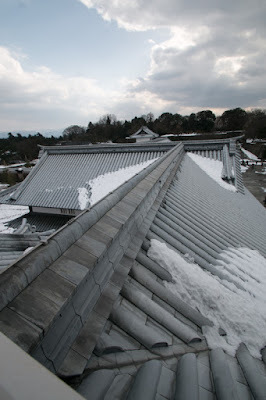 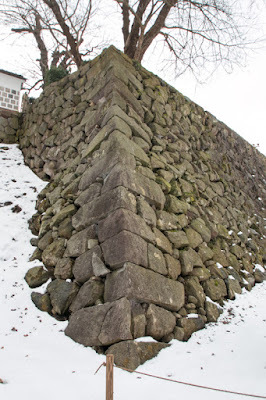 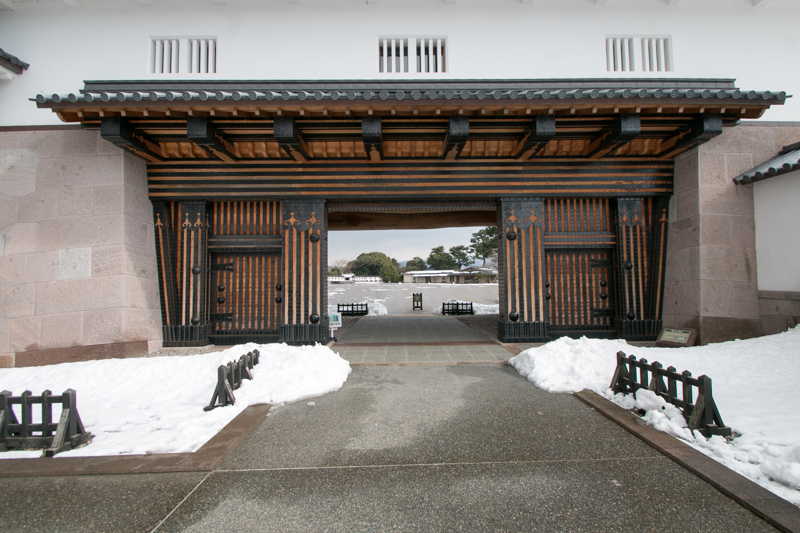 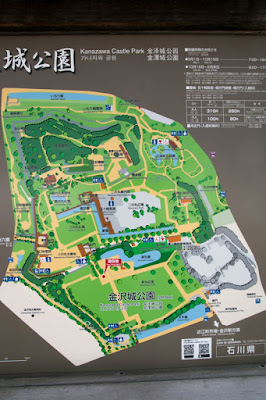 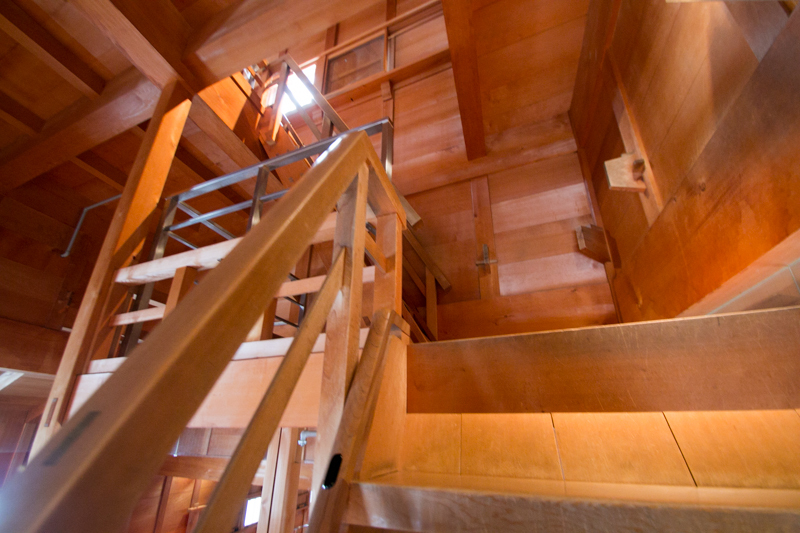 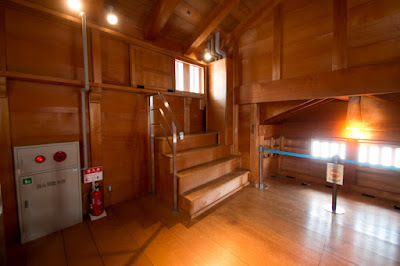 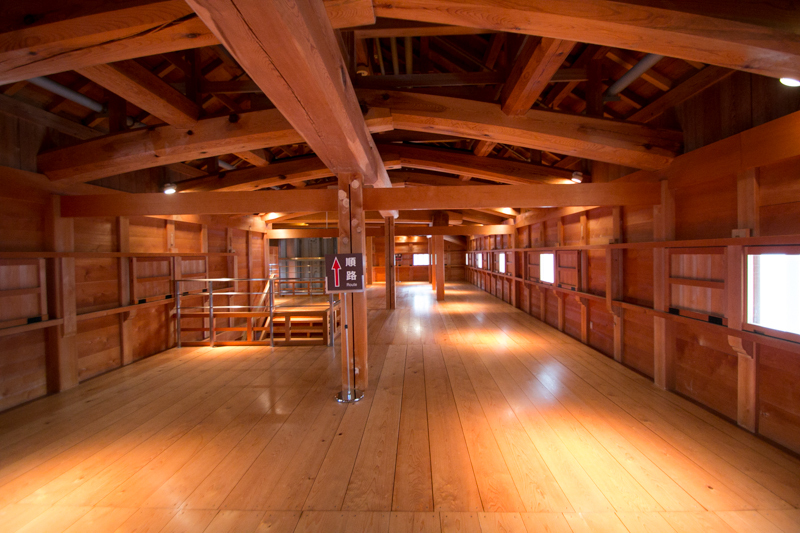 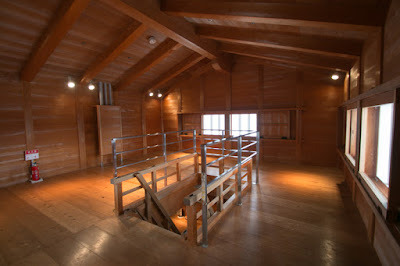 The basic structure of Kanazawa castle is a four layer areas spread like a step from south to north. At the south edge of the height there is a central area of rectangle shape and there was originally a five story main tower at the center of the area. The central area was reformed at the time of Toshiie, and there spread a beautiful tall stone walls along with the backside of the area. 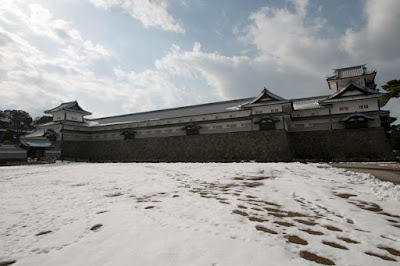 But this main tower was burned down in 1602 and was never reconstructed, and later central area itself was abandoned. Below the central area there is secondary area. 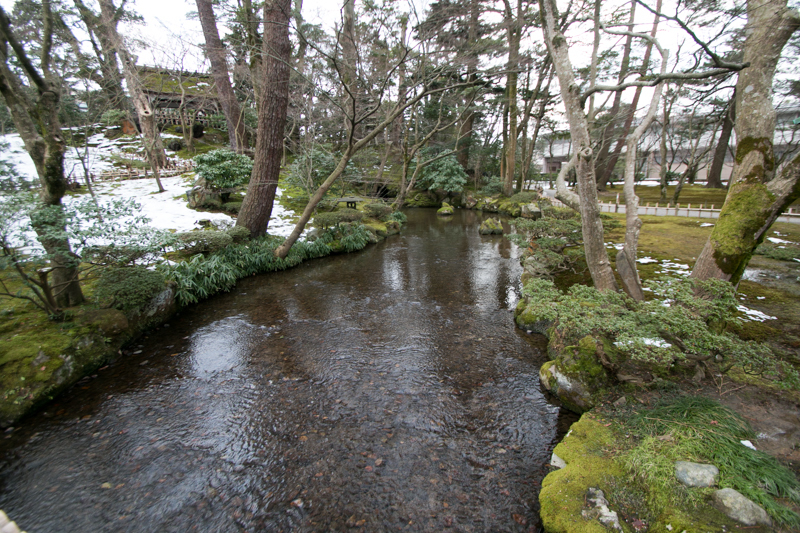 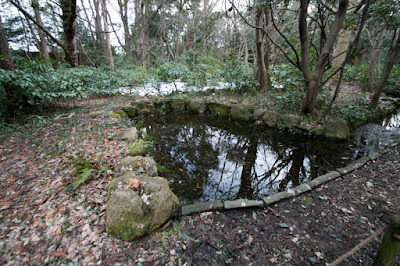 Secondary area spread in front of central area, and is guarded by stone walls and water moats. 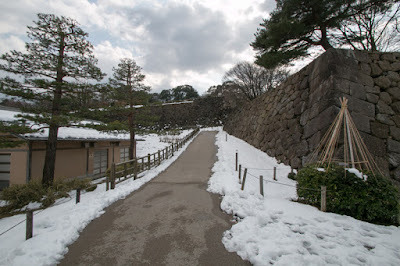 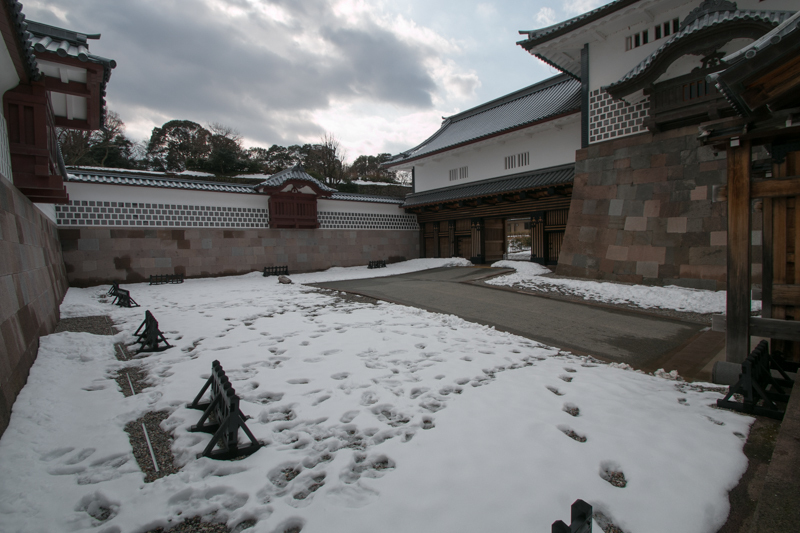 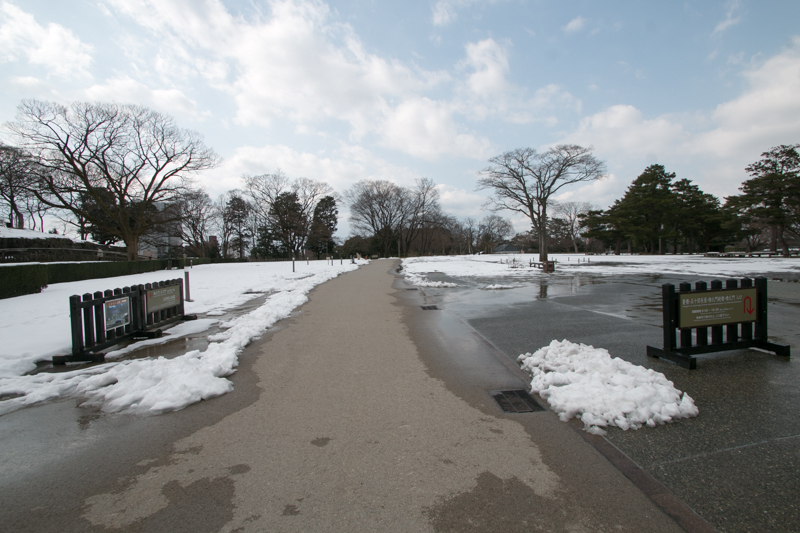 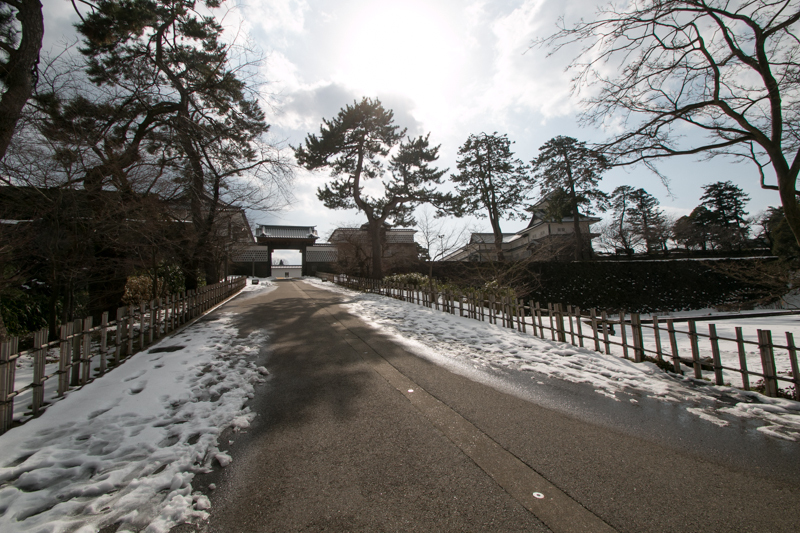 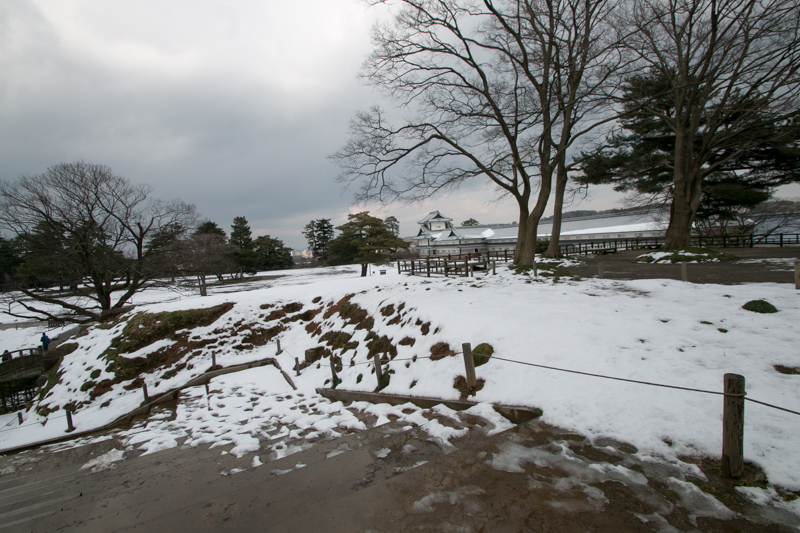 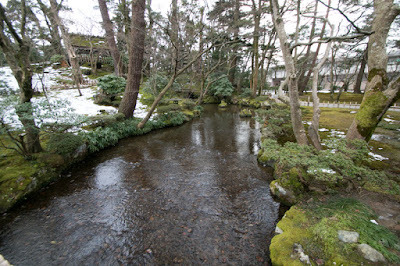 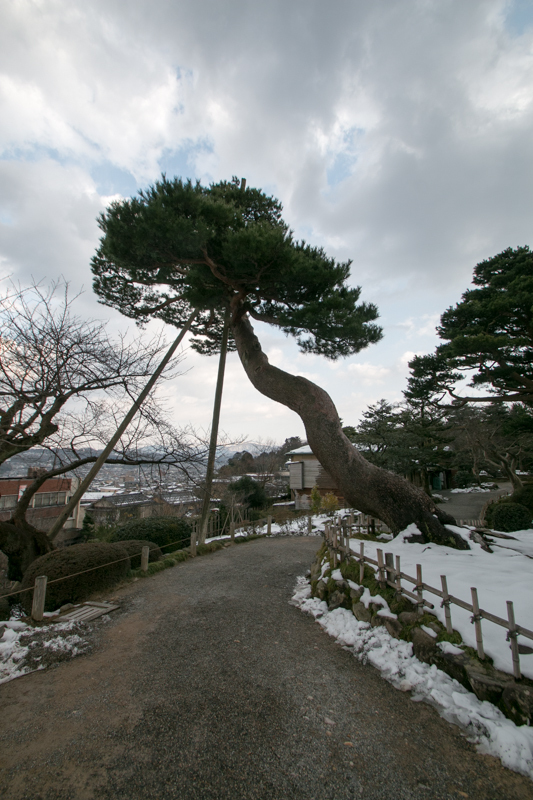 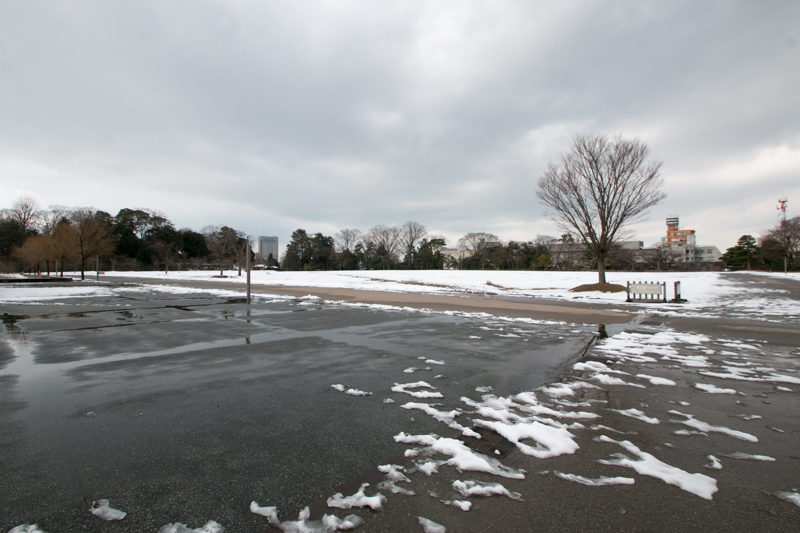 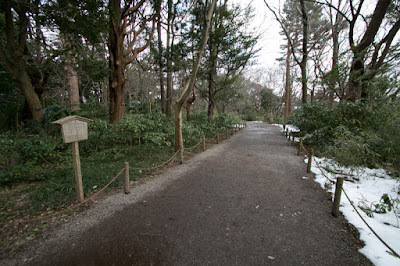 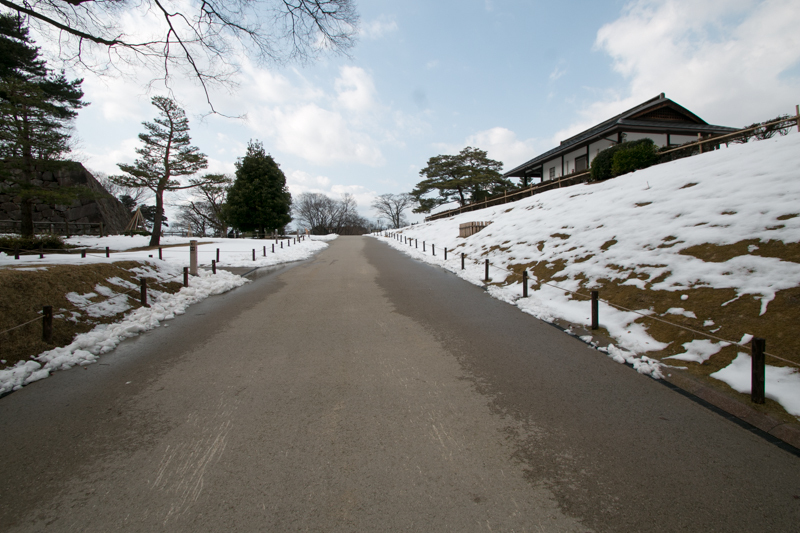 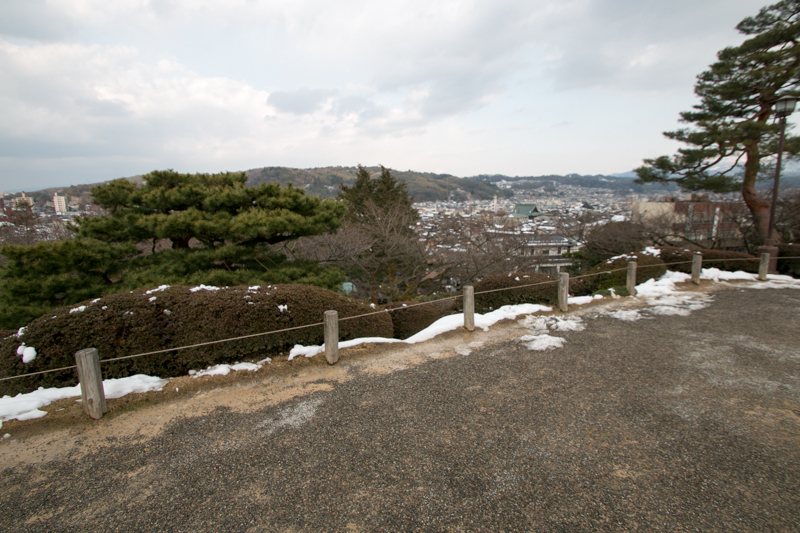 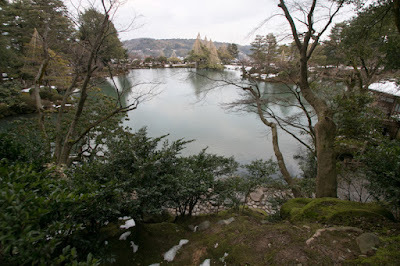 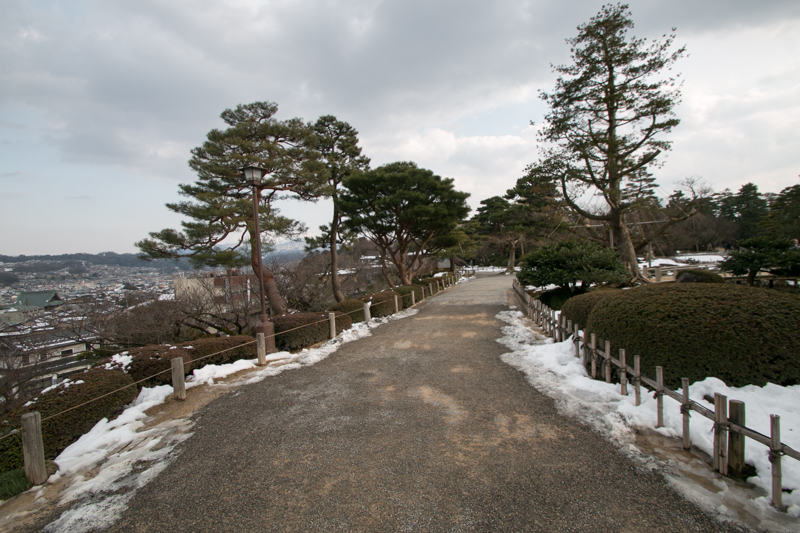 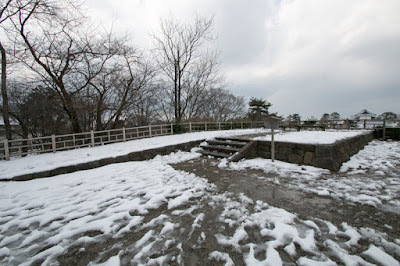 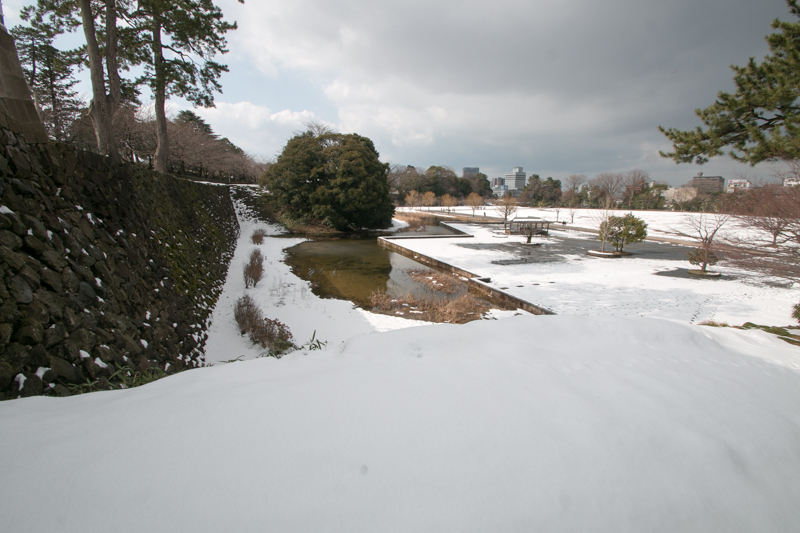 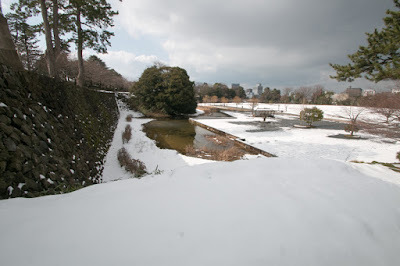 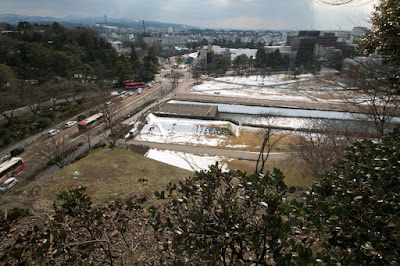 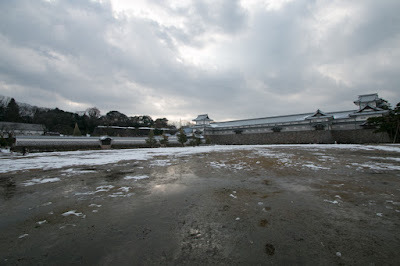 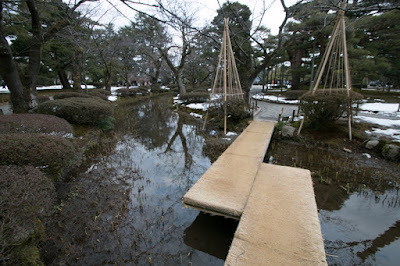 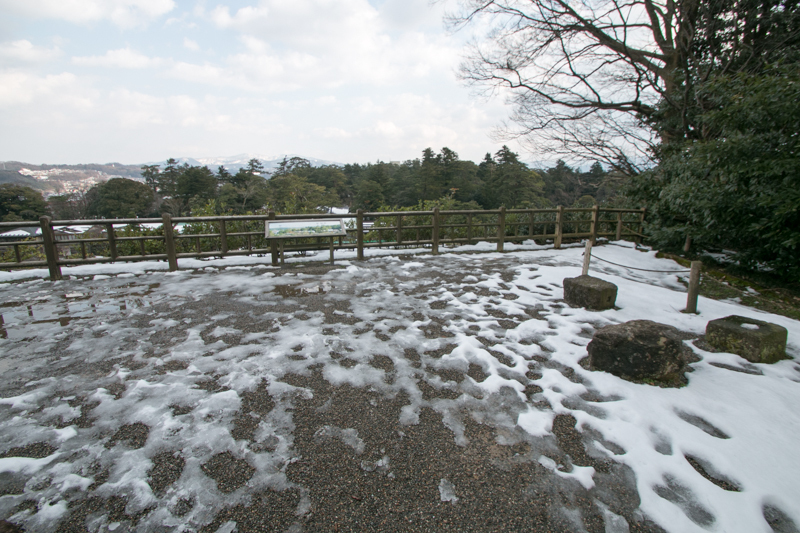 In Edo era this secondary area became the center of Kanazawa castle with splendid palace. 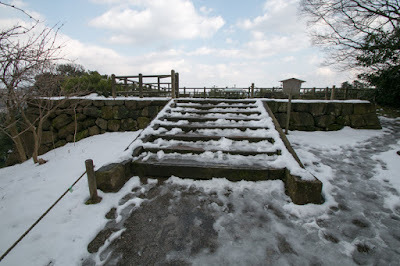 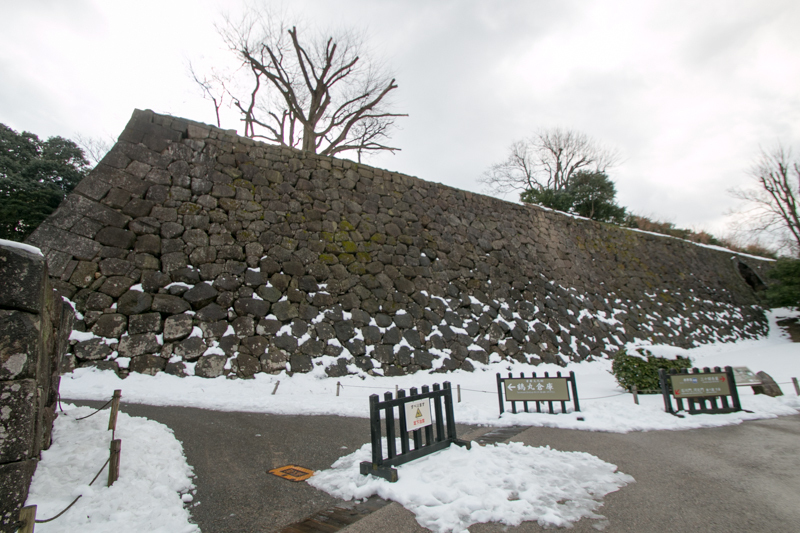 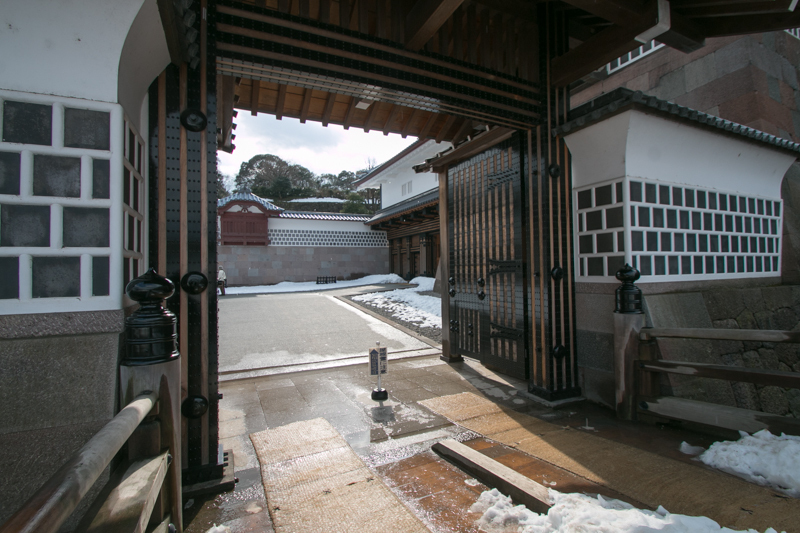 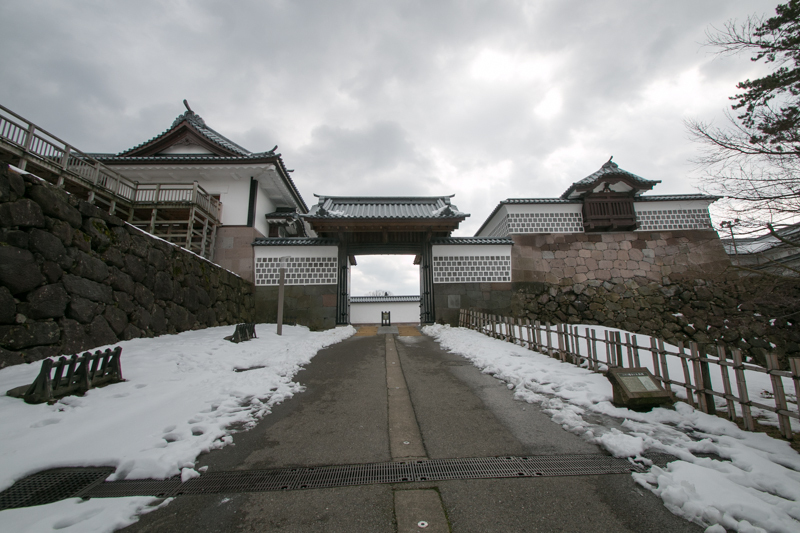 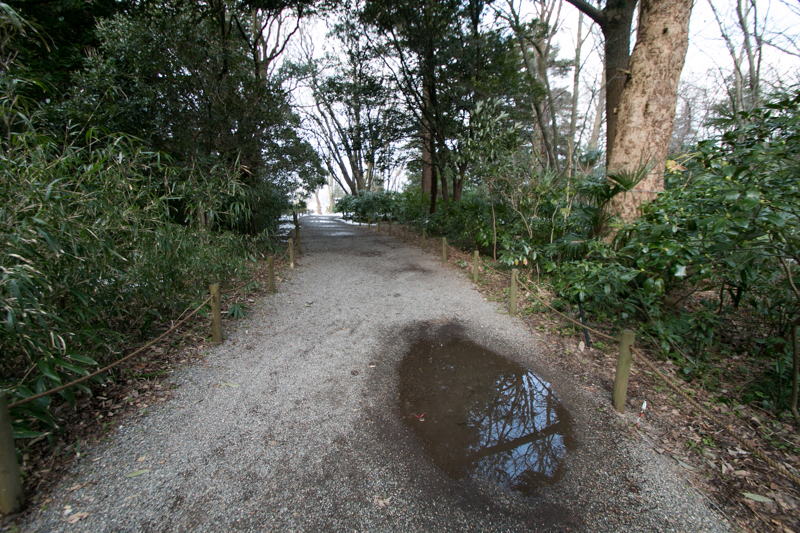 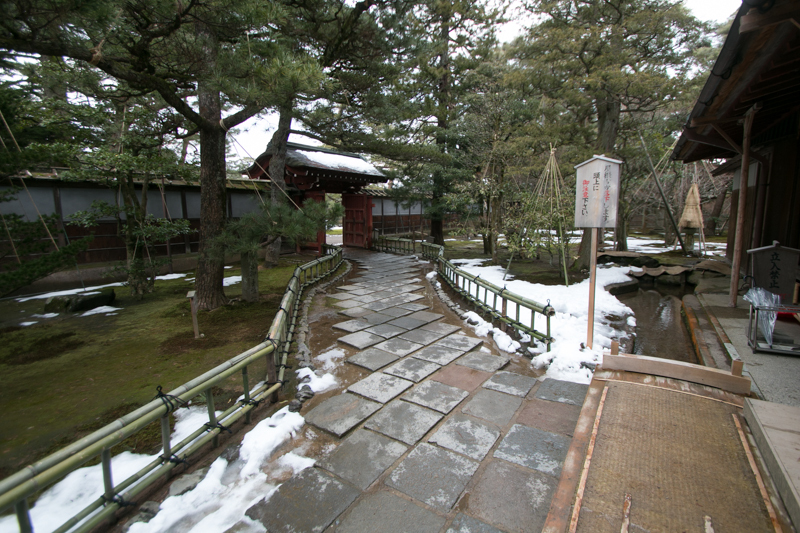 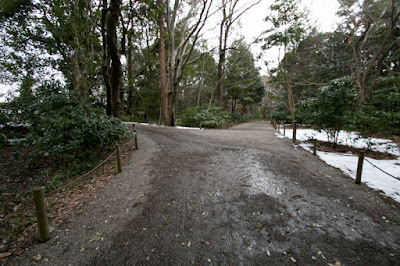 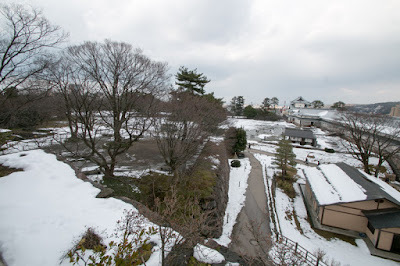 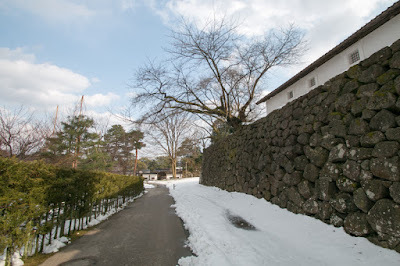 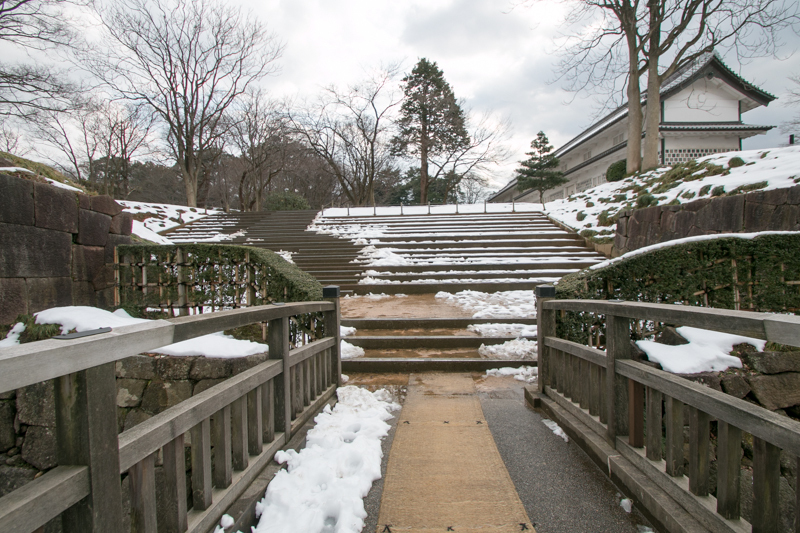 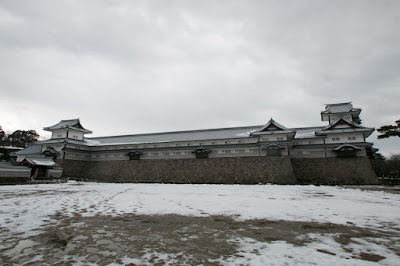 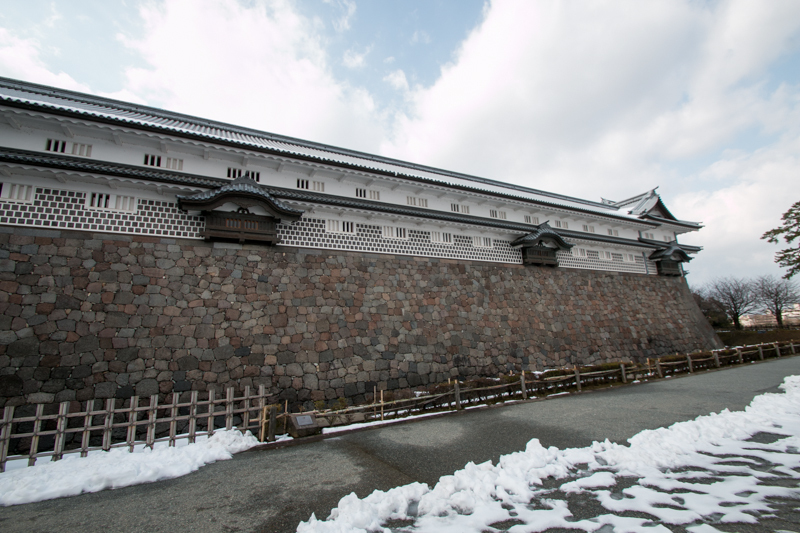 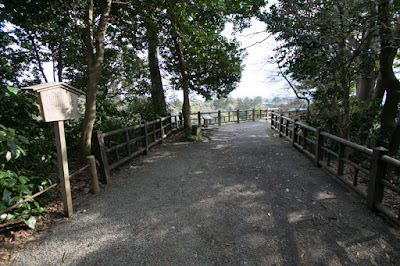 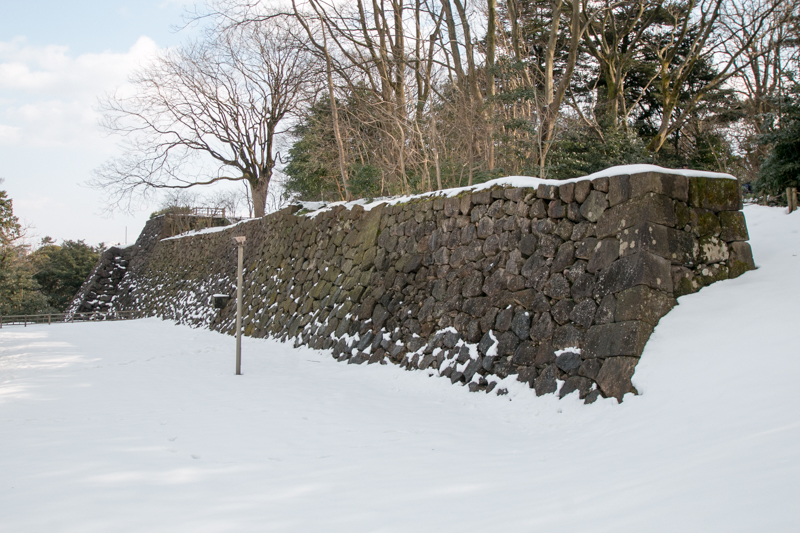 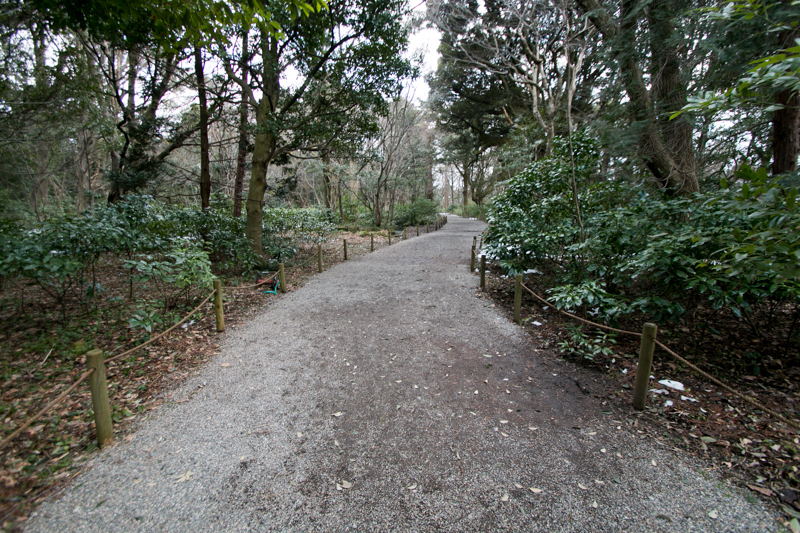 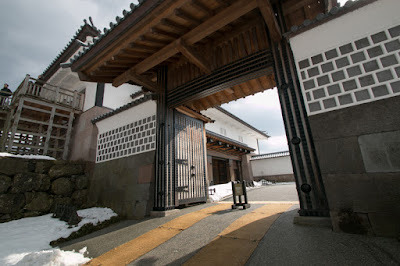 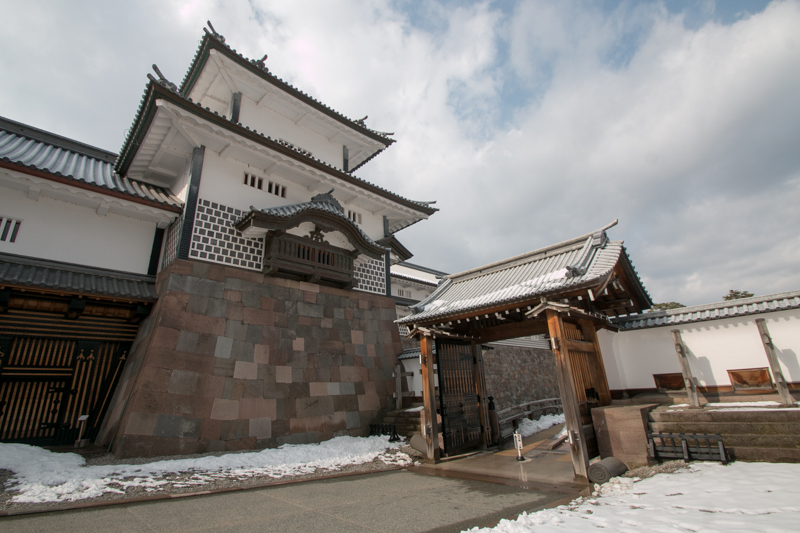 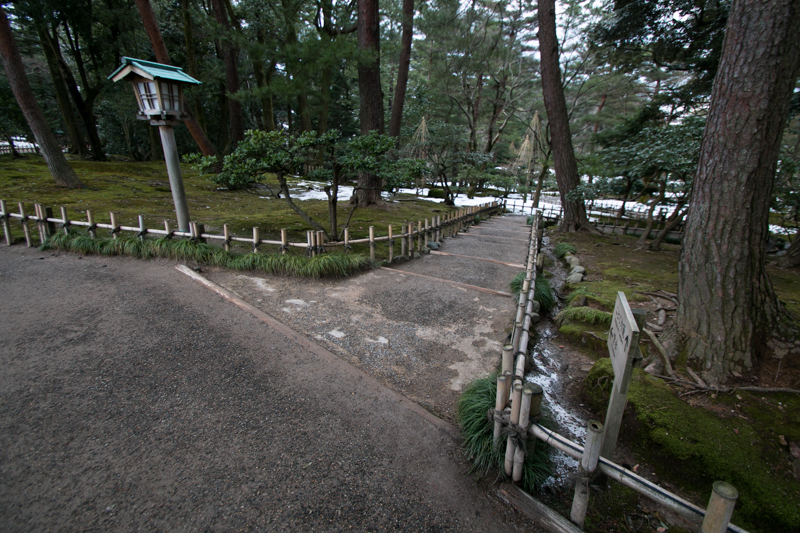 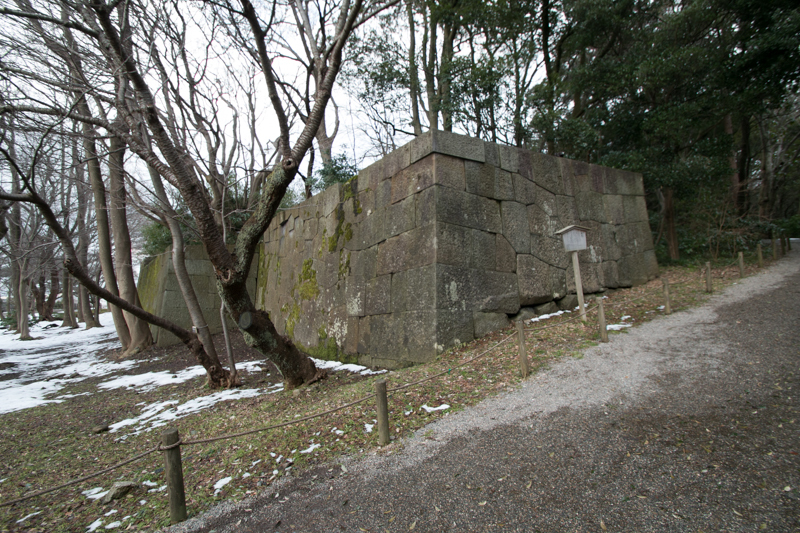 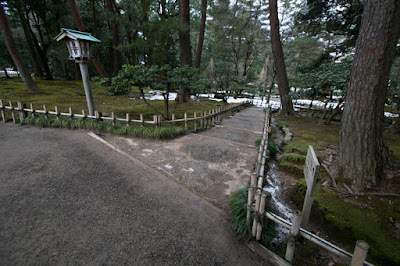 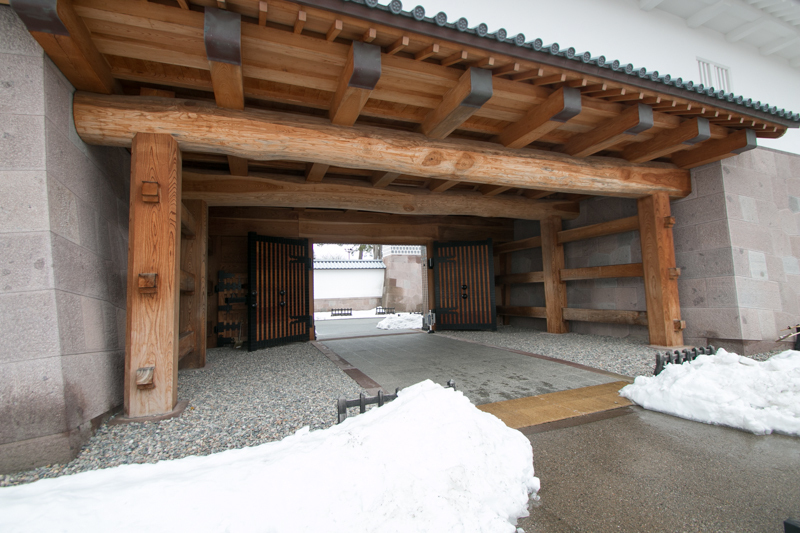 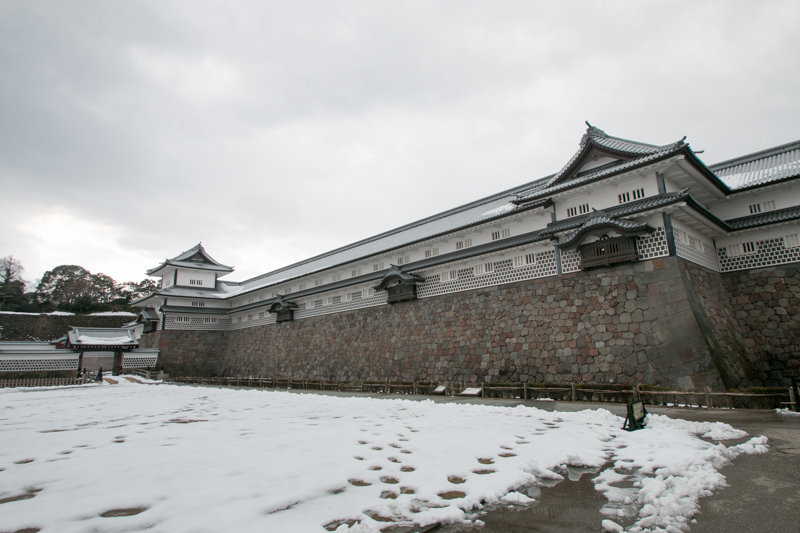 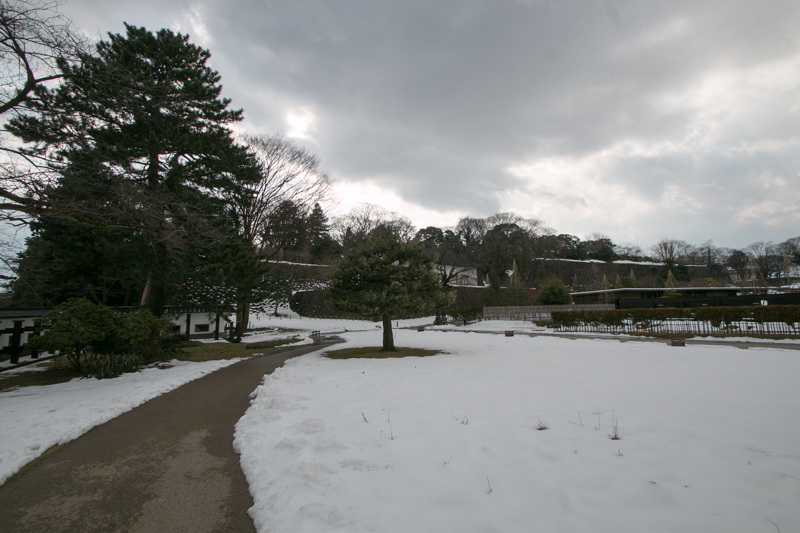 Beside the secondary area there is a third area, a narrow area connected to front gate through Kawakitamon gate and backside area through Ishikawamon gate. 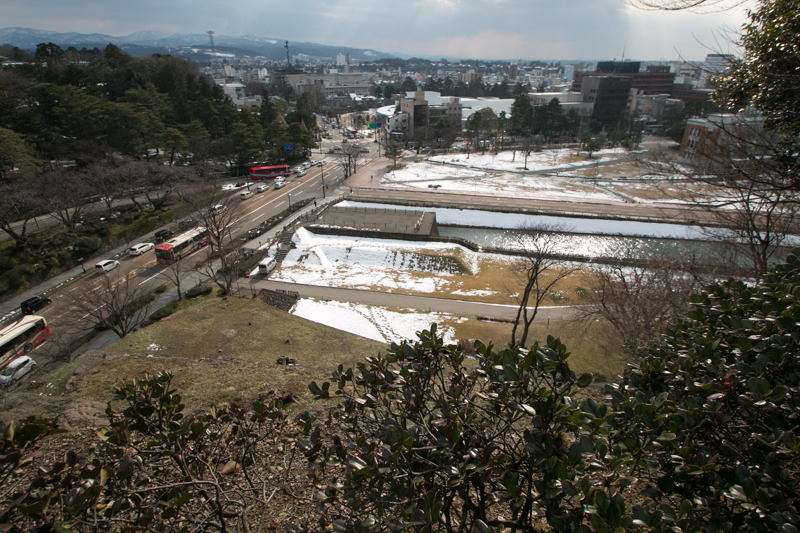 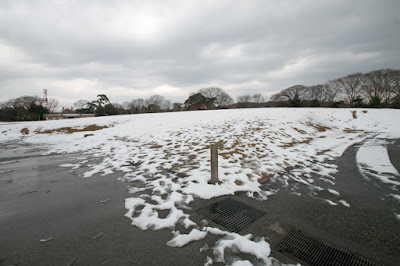 The lowest layer is Shinmaru area, a huge area used for administrative buildings of Kaga domain. 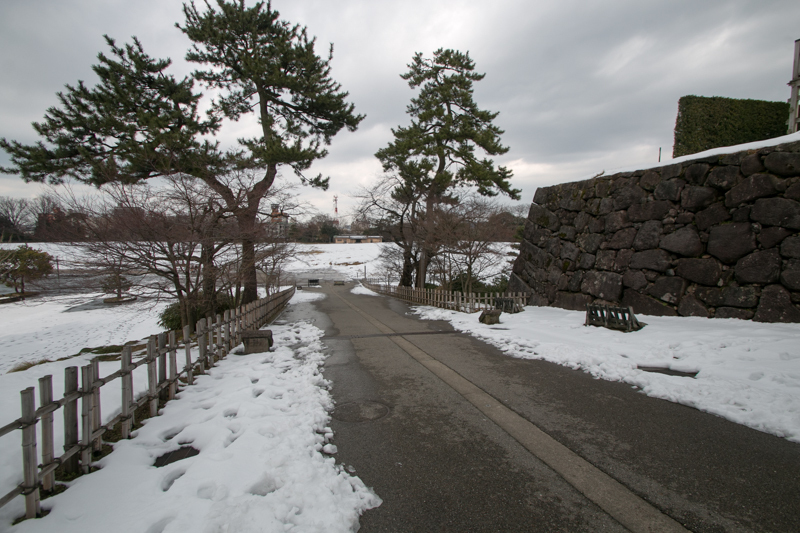 East side of the castle directly connected with bask side is separated by Hyakkennbori, a huge dry moat. 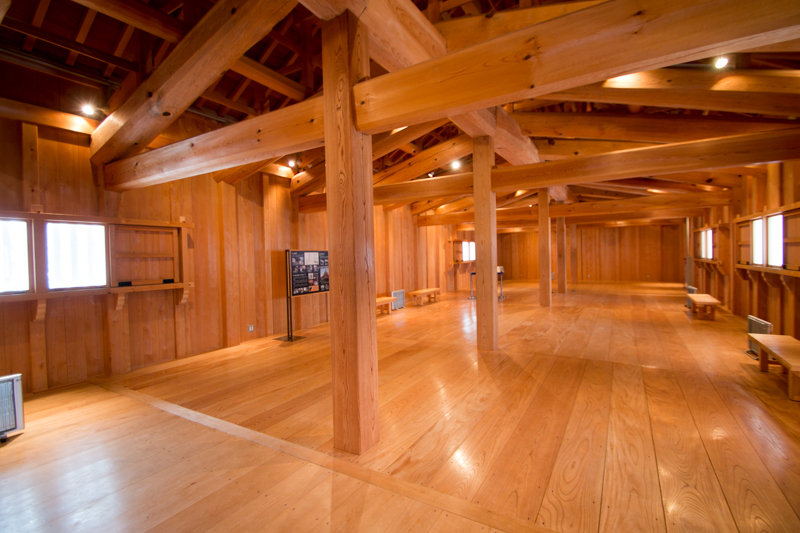 Total size of core area is 600 meter long and 400 meter width, and it is suitable as a residence of grand minister of Toyotomi government.